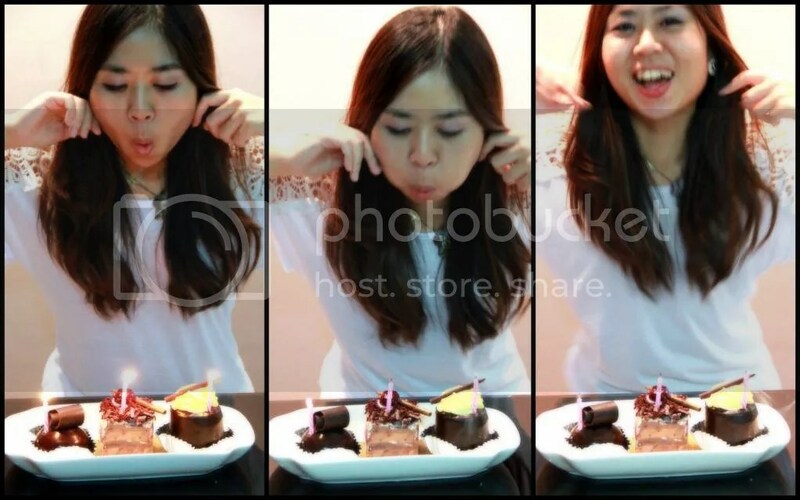 Upon celebrating my 31st birthday (alamak….tak sangka I’m already 31 years old! ), Alex asked what would I like to eat. Ya… he often let me decide.. therefore I hardly have surprises. LOL!! 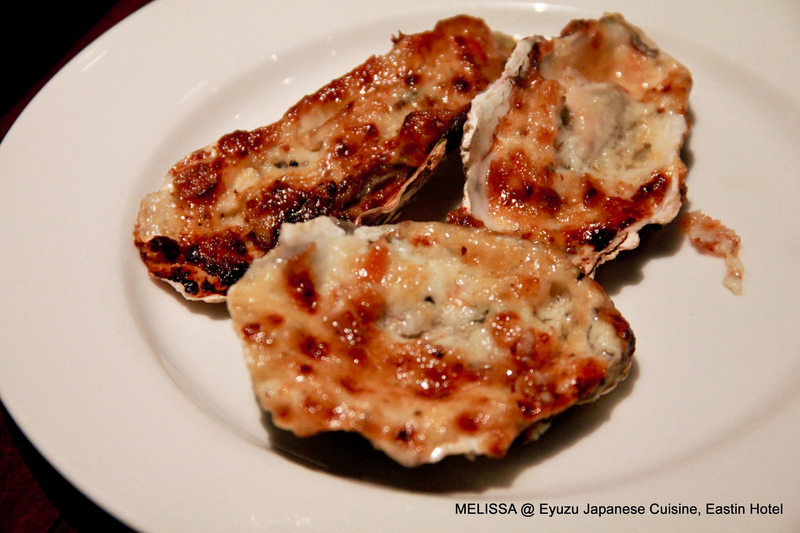 This year, I’m telling Alex… I don’t feel like having Western or Japanese food. Lets go for Chinese cuisine 😀 I’ve heard many good reviews about this Chinese Restaurant that we intend to go to. 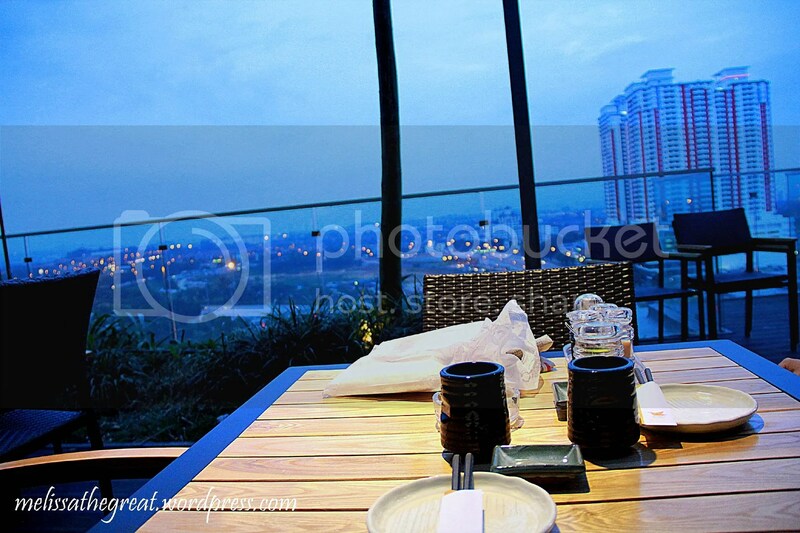 We put up a night at Cititel Hotel and then came here for dinner. 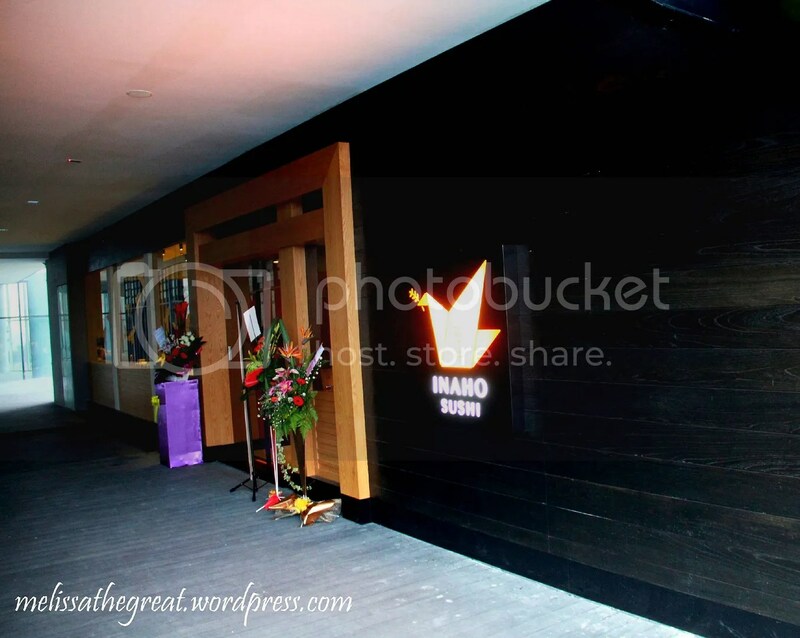 The Han Room is located very near to the entrance of The Gardens Hotel. Hmm… I should say, just next door. We were served with this small plate of titbits (RM5). Its pretty addictive and nice. Not those dull looking titbits that I usually had. 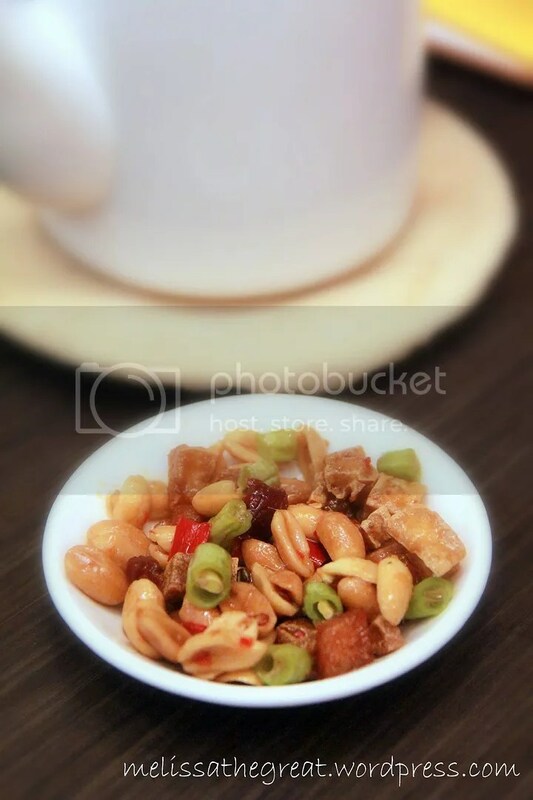 The above titbits has mild spiciness, comprised of crunchy peanuts, long beans, fried beancurd. 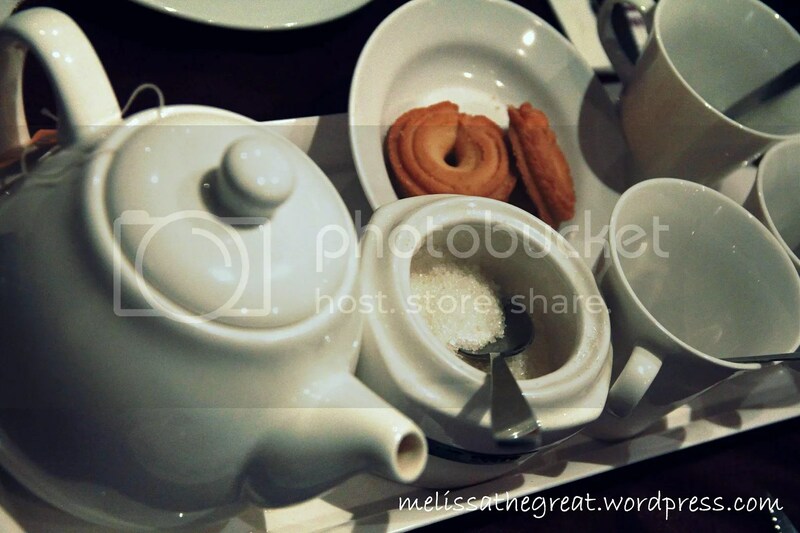 I’m not a tea expert, but I like to choose Chinese tea over other drinks when I dine in a Chinese restaurant. Alex was still enjoying the titbits while we were waiting for our food to arrive. I like the ambiance here. 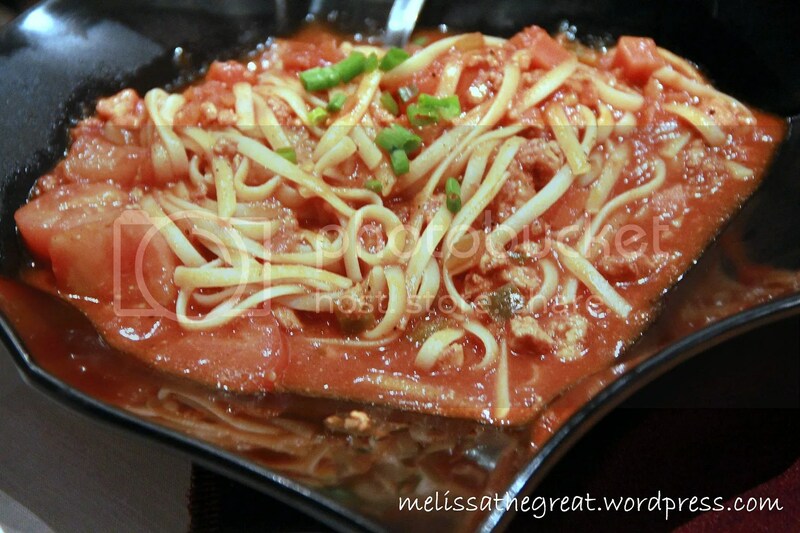 An appetizing Paku in Spicy Sauce (RM8) ,a cold dish as our starter dish. It wasn’t really spicy actually. 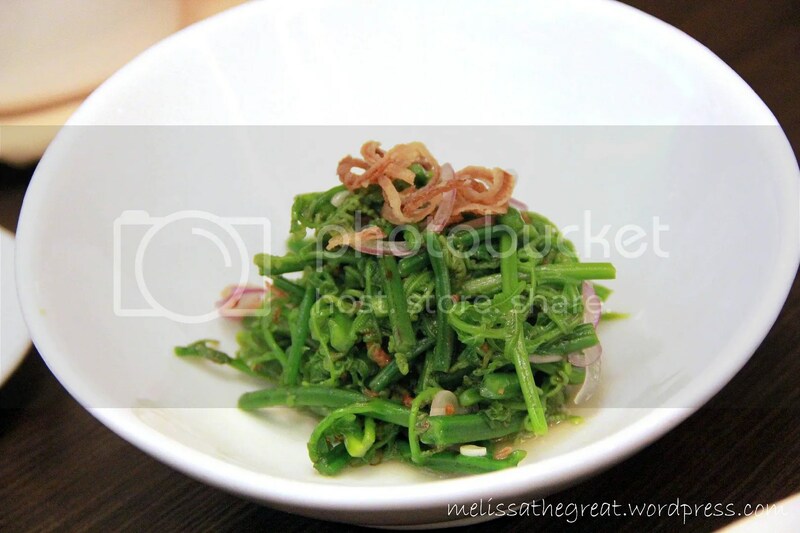 Crunchy fern mixed with shallots and dried shrimps. The dressing is abit spicy and sourish, something like kerabu. Our meat platter. 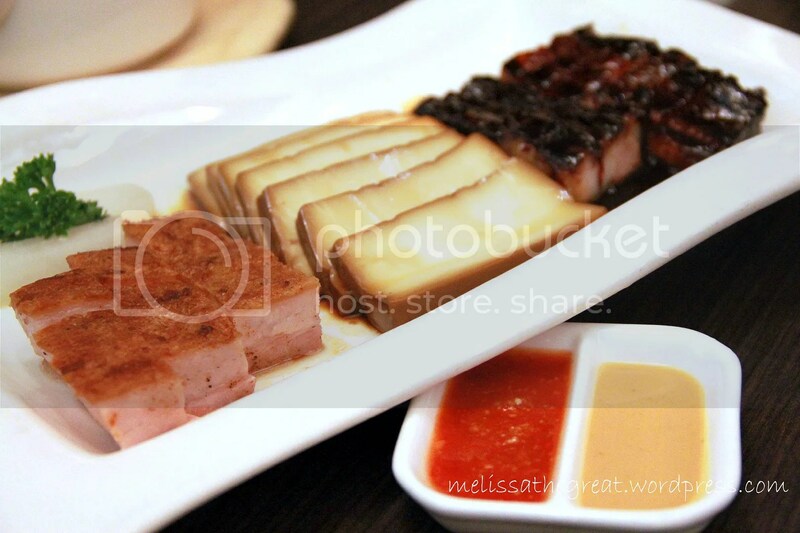 2 combinations – Roasted Pork + BBQ Pork (RM30) with dipping sauce. I dislike the yellow dipping sauce. The smell was so strong. 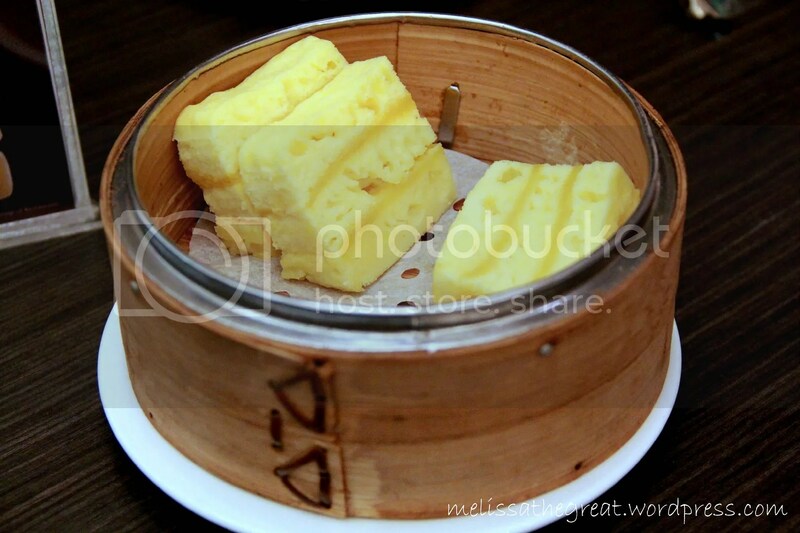 I think its made of ‘bamboo shoots’. While the red one is chili sauce. It was a gloomy evening. 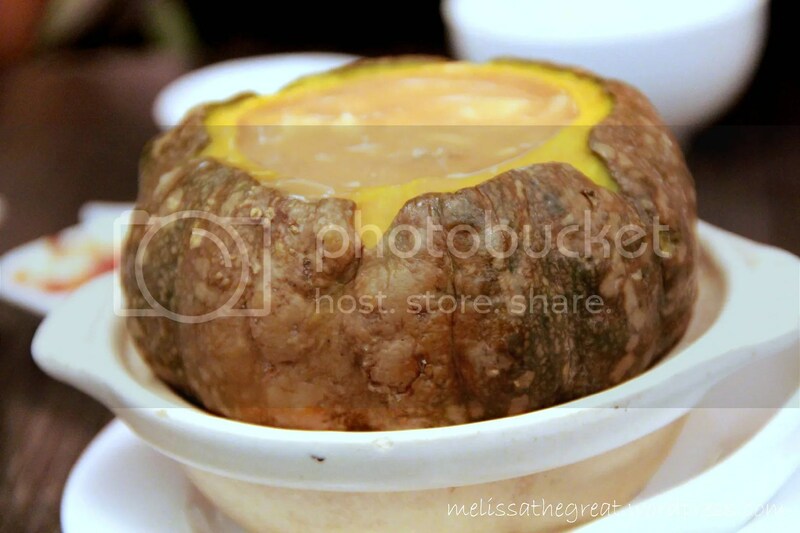 Why not order a soup dish. 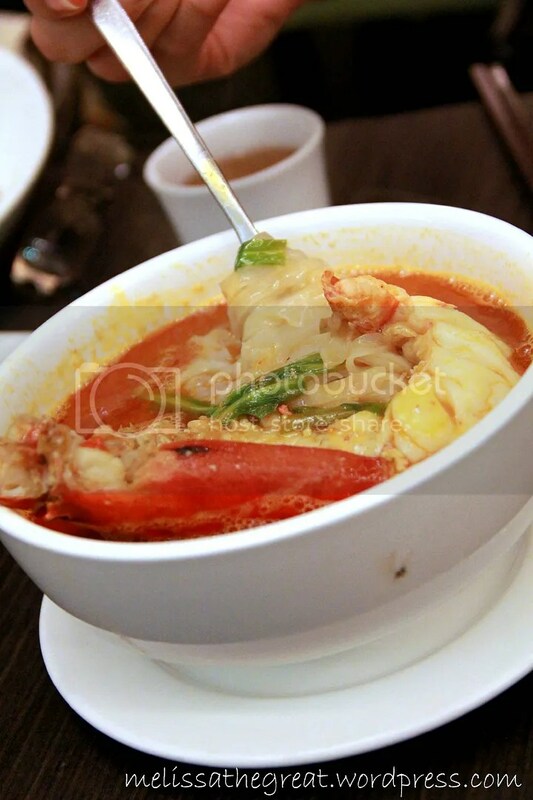 We chose Braised Lobster Soup in Pumpkin – RM28. 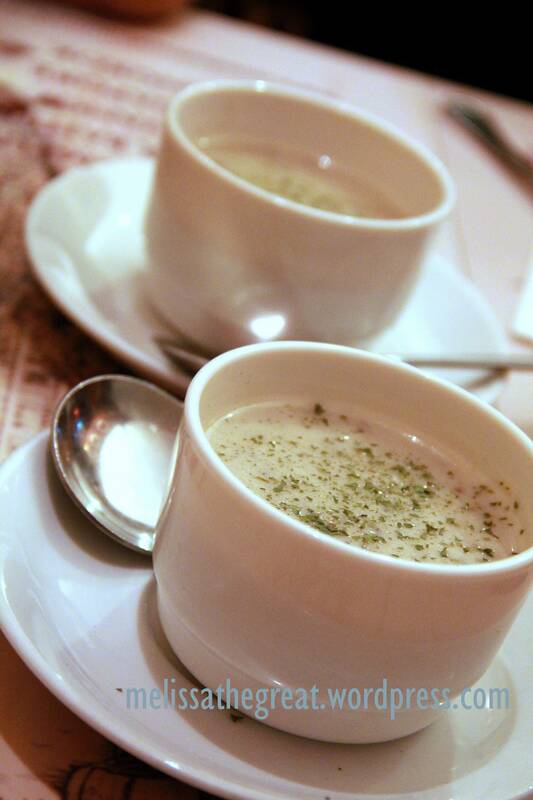 The soup portion was enough for both of us. 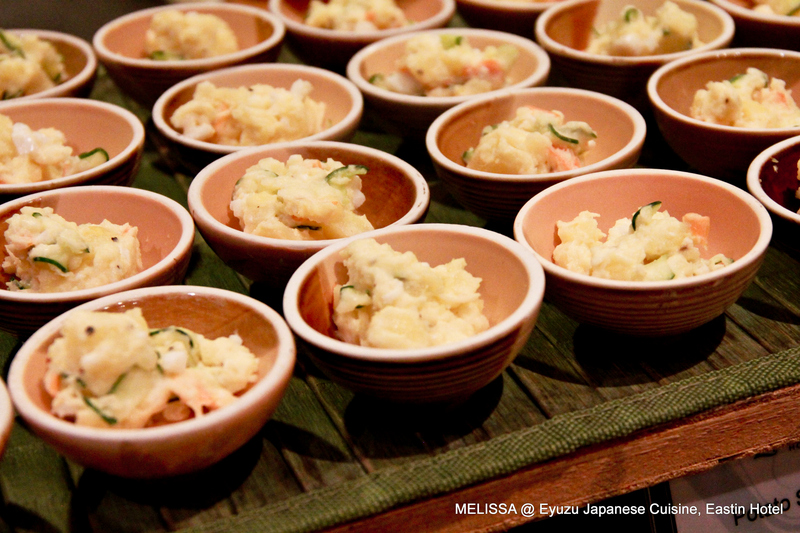 Rich flavors and ingredients. 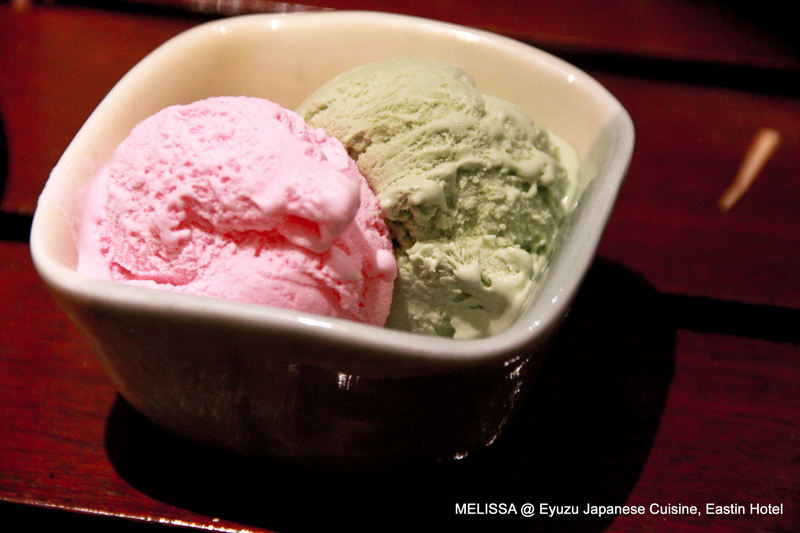 Each scoop has spoonful of lobster meat. 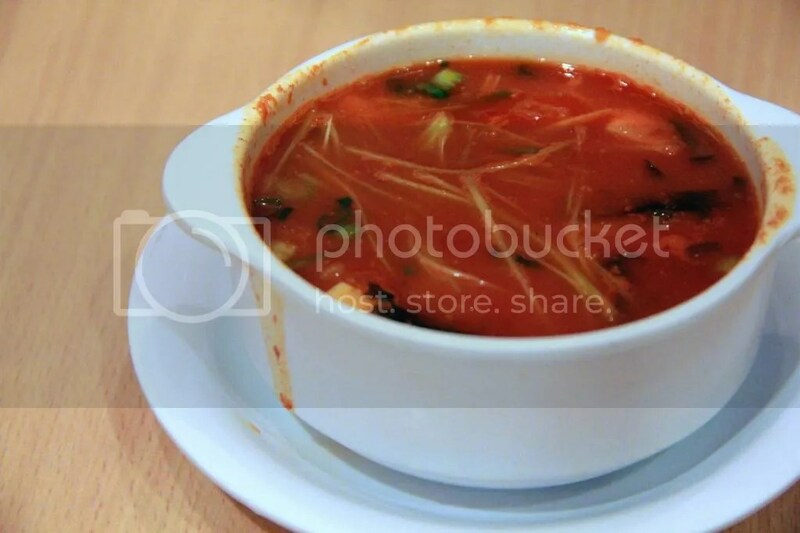 The soup taste kinda reminds me of shark fins soup 🙂 Don’t worry….there ain’t any shark fins in the soup. Pumpkin vs. My Face. My Face wins…. LOL!! Then came this bowl of ‘geng’ noodle. The soup flavor was so rich. 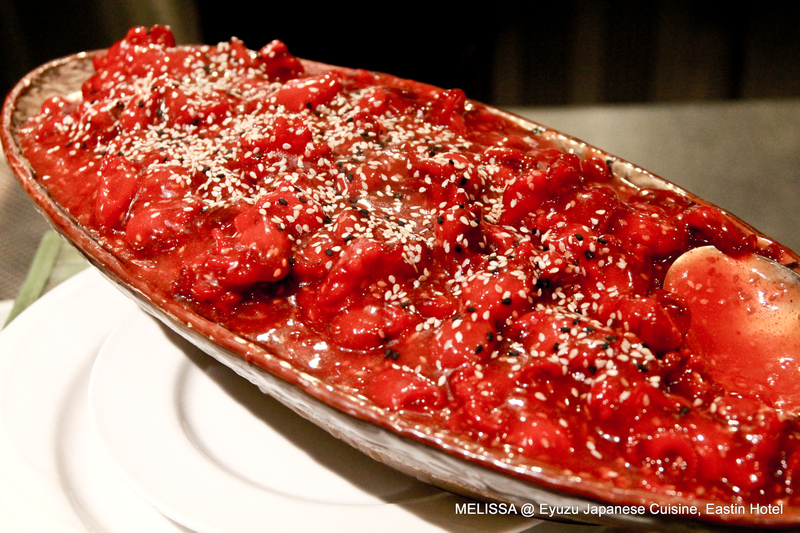 Robust flavors of prawn roe. And the hor fun was smooth too. 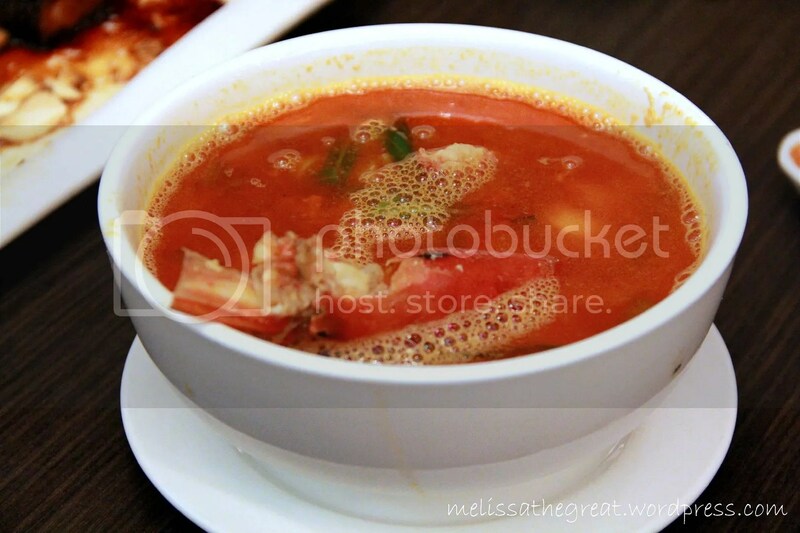 Nice to have this especially on rainy day. 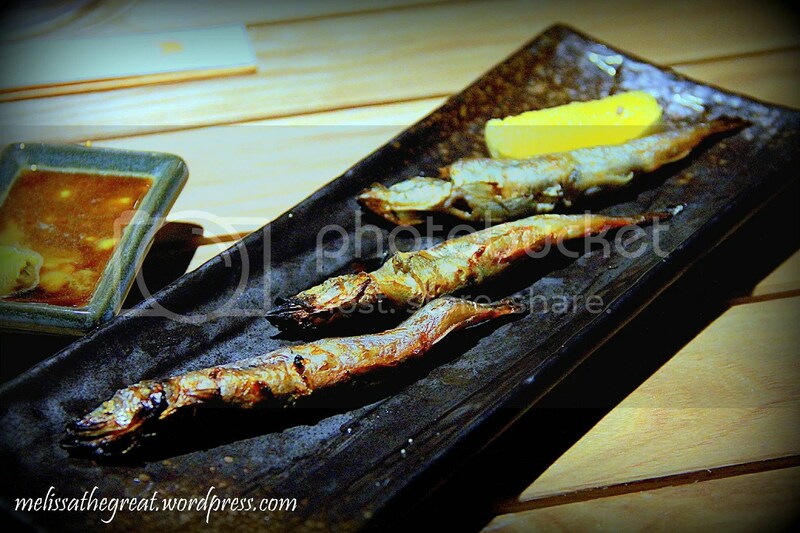 Only half piece of fresh water prawn was served with the hor fun. 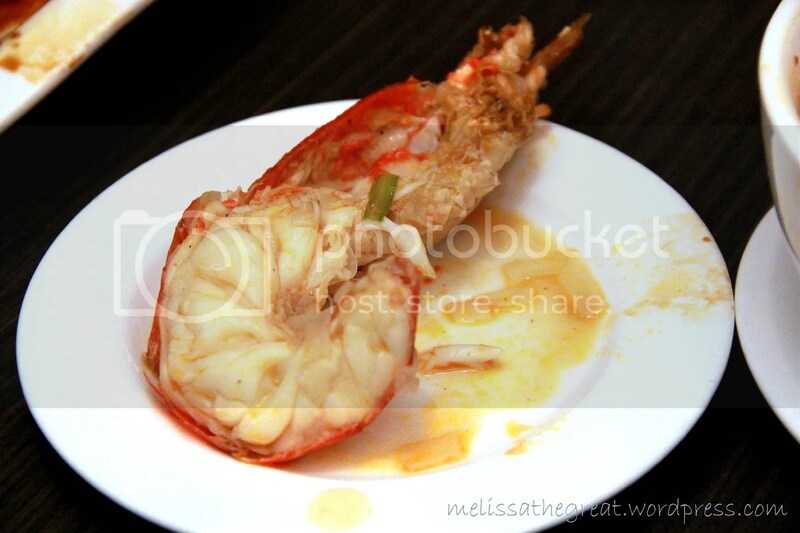 No doubt the prawn size was quite big lar. 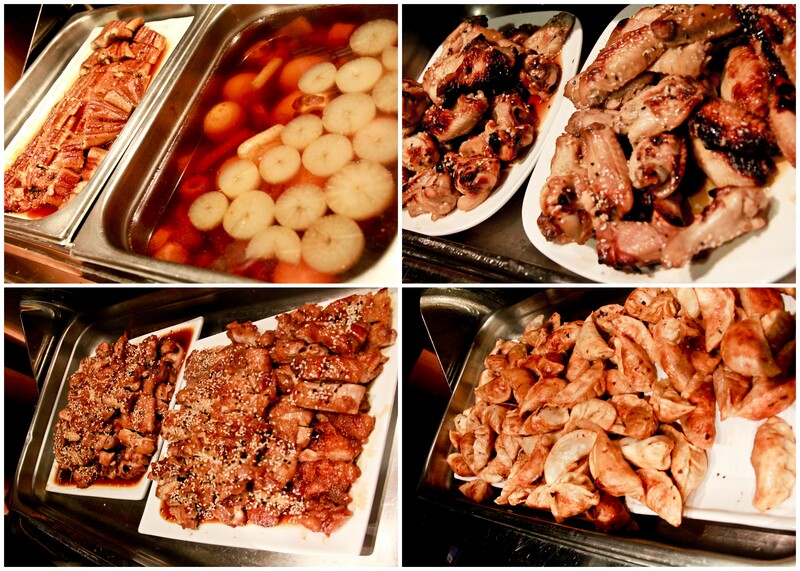 Verdict : At Han Room, the food prices are of course higher than those normal Chinese Restaurant. 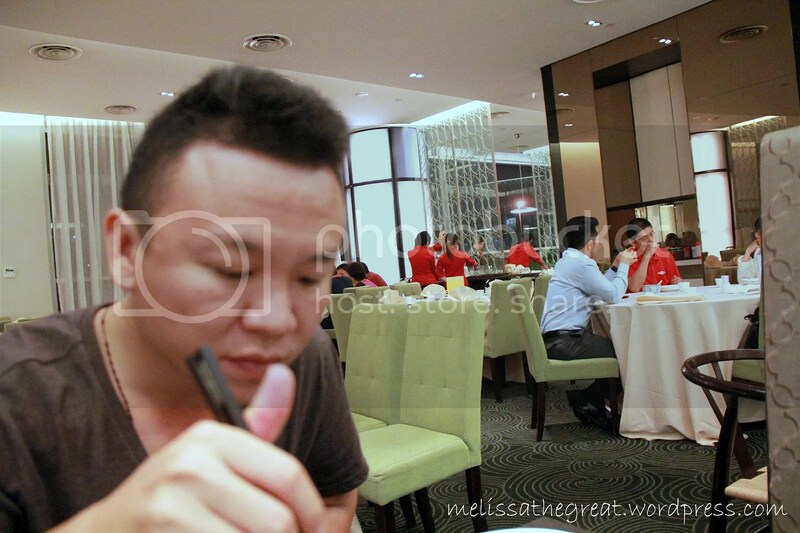 But speaking about the environment, service and the quality of food I had, I’m pretty satisfied. After all its a once in a while thing ma. 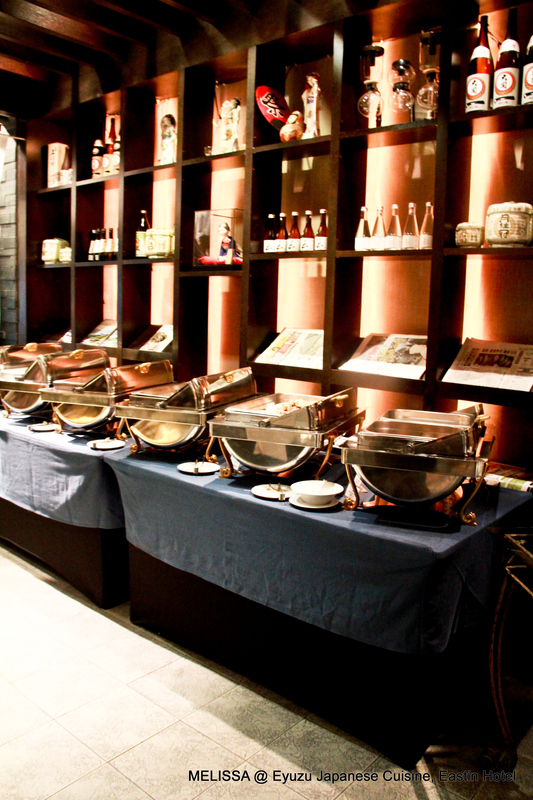 They do offer dim sum and set menus. You can drop by their website to take a look. Lingkaran Syed Putra, 59200 KL. 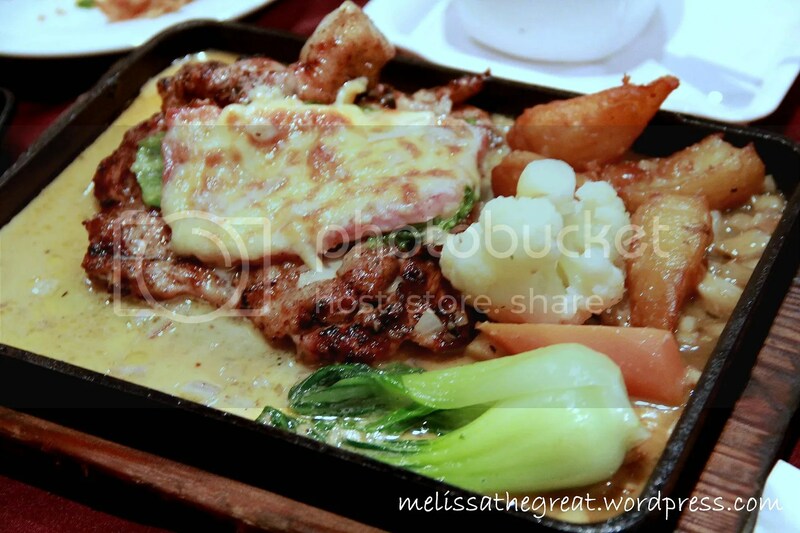 Speaking about western food in Seremban, there aren’t much choice. Unlike those Chinese ‘Dai Chow’ which can be find easily. Kensington Restaurant in Seremban will often come across our mind when refer to serving decent western food with affordable pricing too. I think my Seremban folks would agreed as well. Kensington has existed for many years. 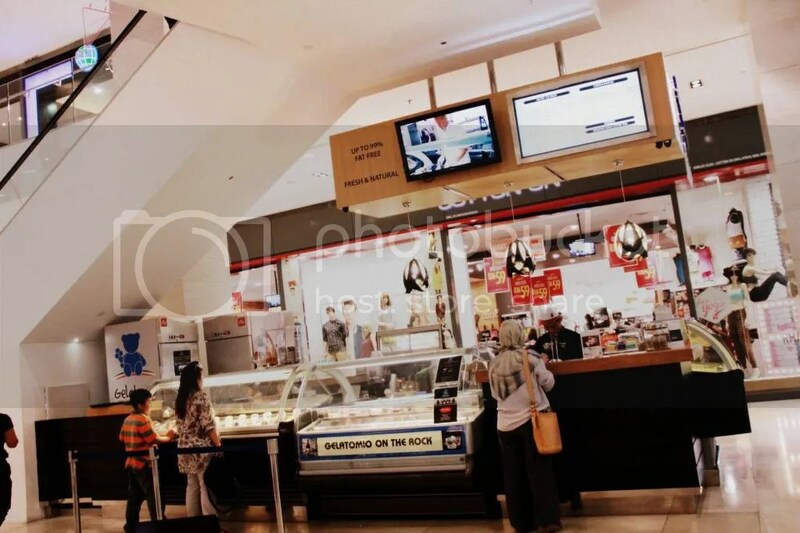 It has total 2 outlets in Seremban. 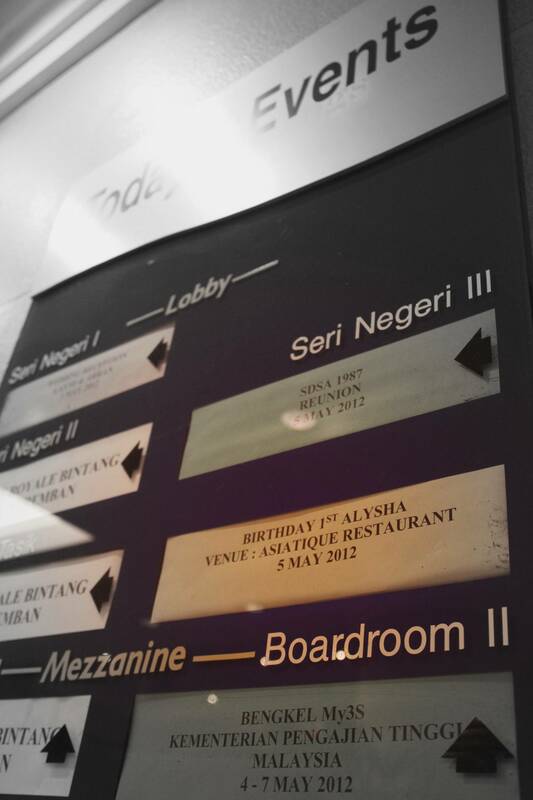 On mummy’s birthday, we decided to go there for dinner. 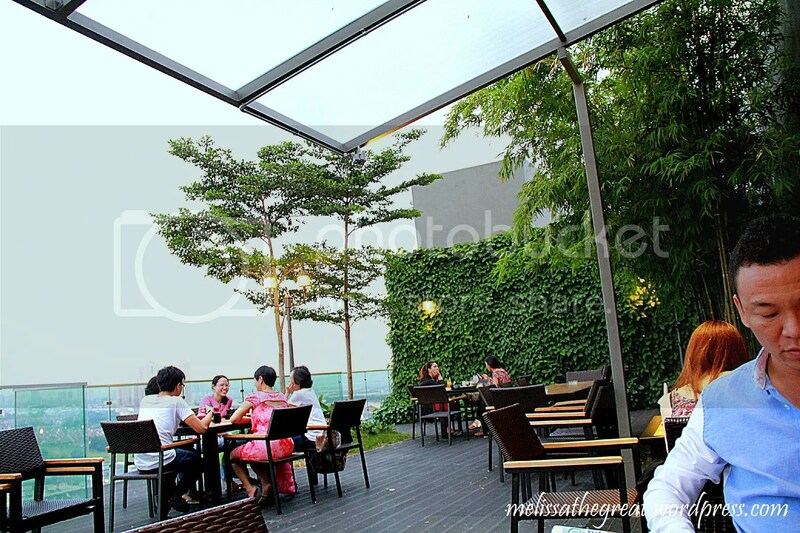 This place is often crowded over weekends, dinner and especially on festive seasons. 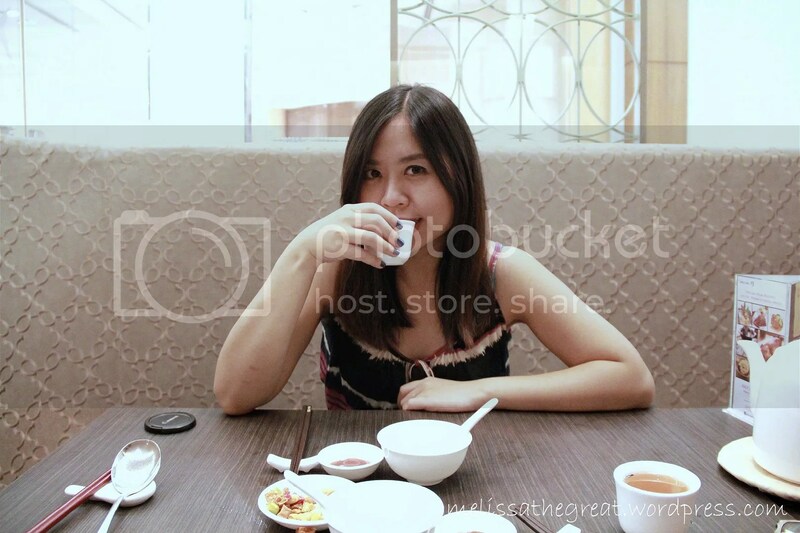 A pot of Peach & Passion fruit tea for RM10. My cheeky niece insisted to shoot a photo of her. Started off with a bowl of Cream of Mushroom Soup for RM4.30. 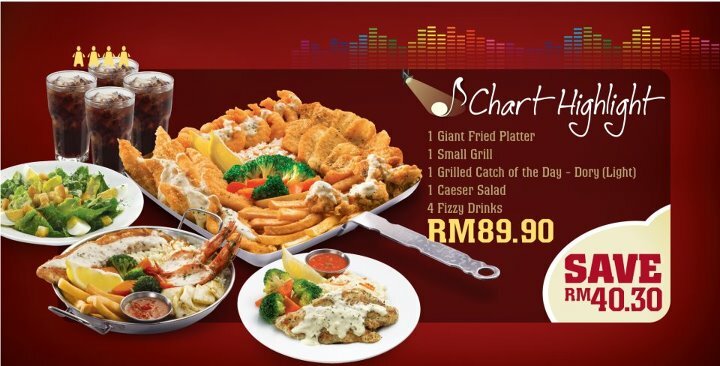 I ordered a Seafood Platter for RM48, enough for 3-4 eaters. 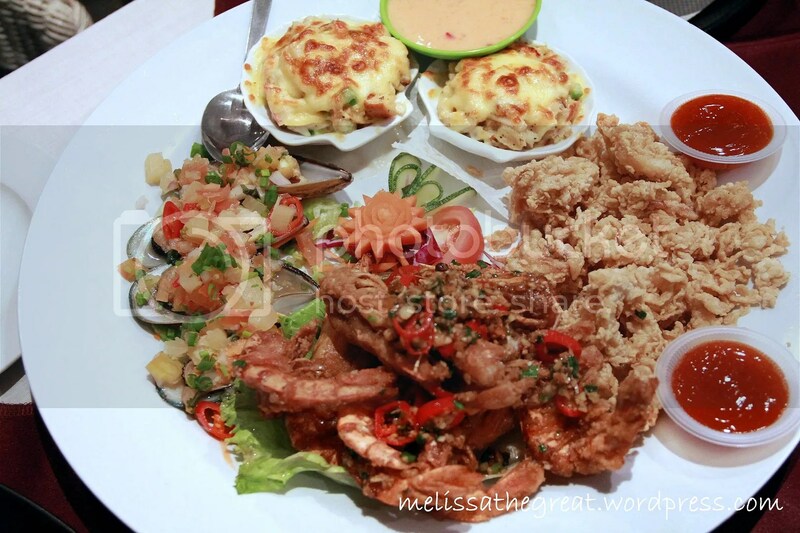 This seafood platter comes with Stuffed Crabs with Cheese, Fried Prawn with Salt & Pepper, Fried Squids with Tangy Sauce, Mussels Tomato Salsa. All the above are quite good. 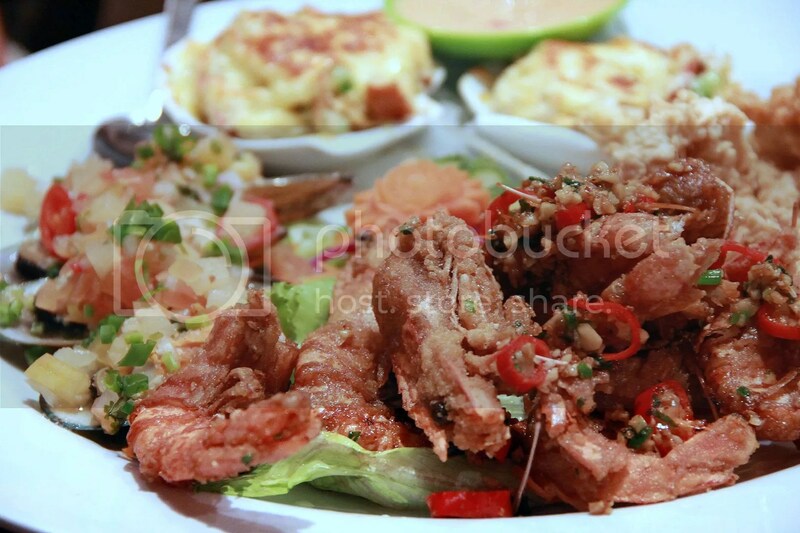 I especially like the Mussels Tomato Salsa (very appetizing) and Stuffed Crabs with Cheese. 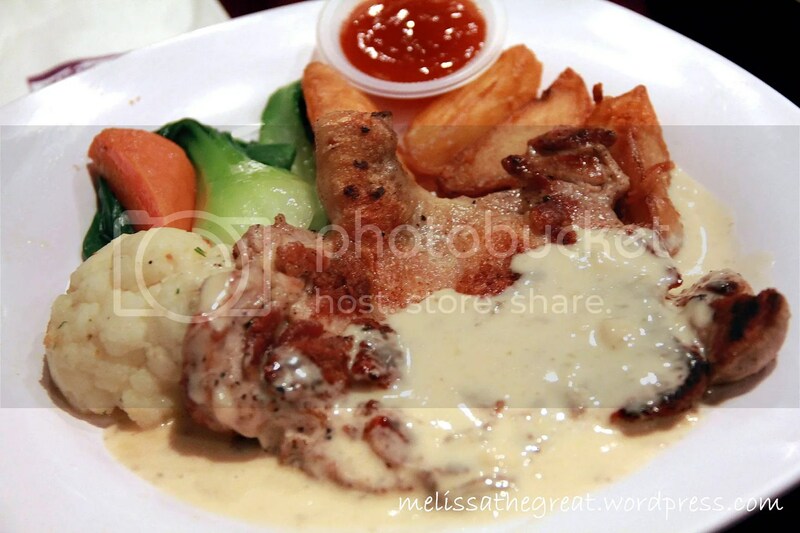 We all love this Sizzling Chicken topped with Ham & Cheese served with Butter Cream Sauce for RM16. 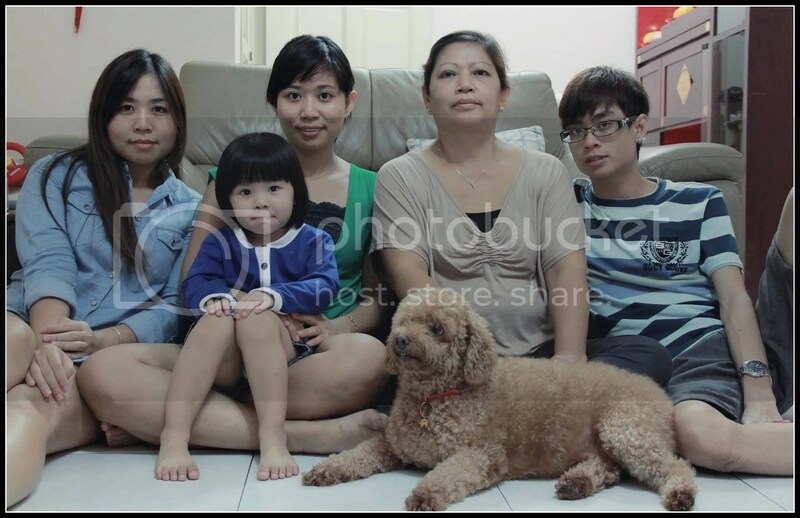 My family enjoyed the dinner. 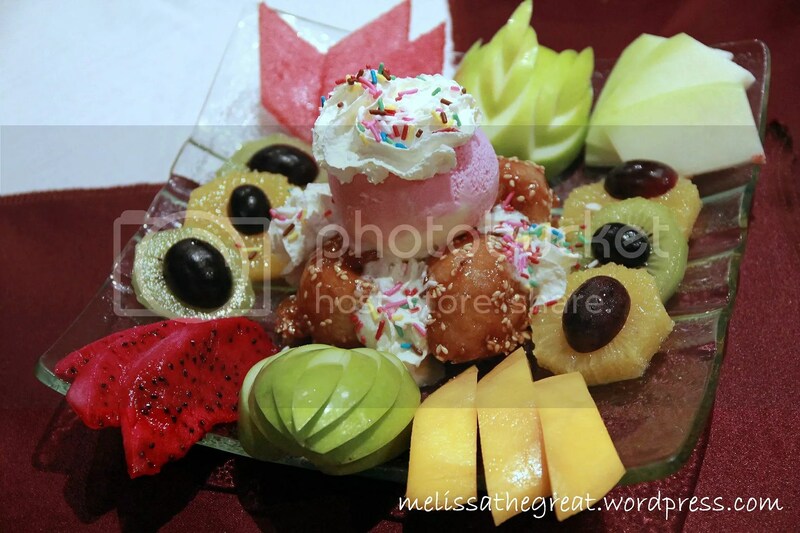 For dessert, we had Toffee Banana with Ice Cream & Mixed Fruits – RM12. I like the toffee banana. 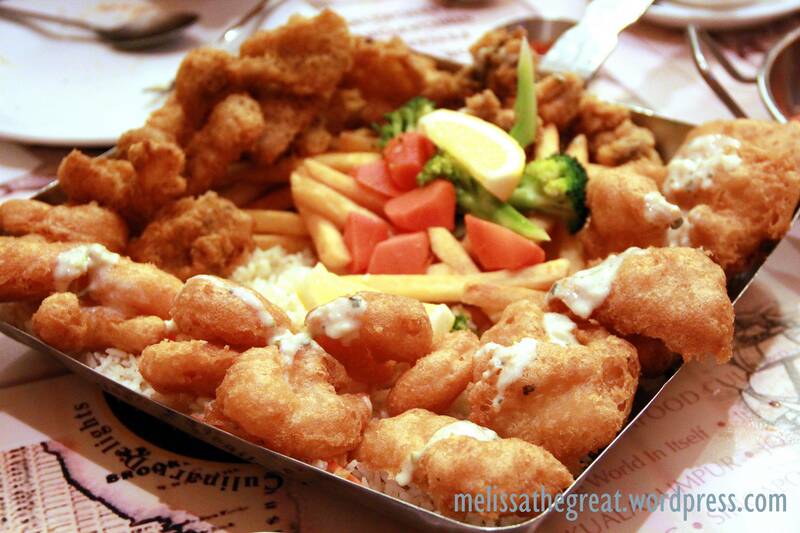 Just like crispy pisang goreng coated with caramelized toffee. 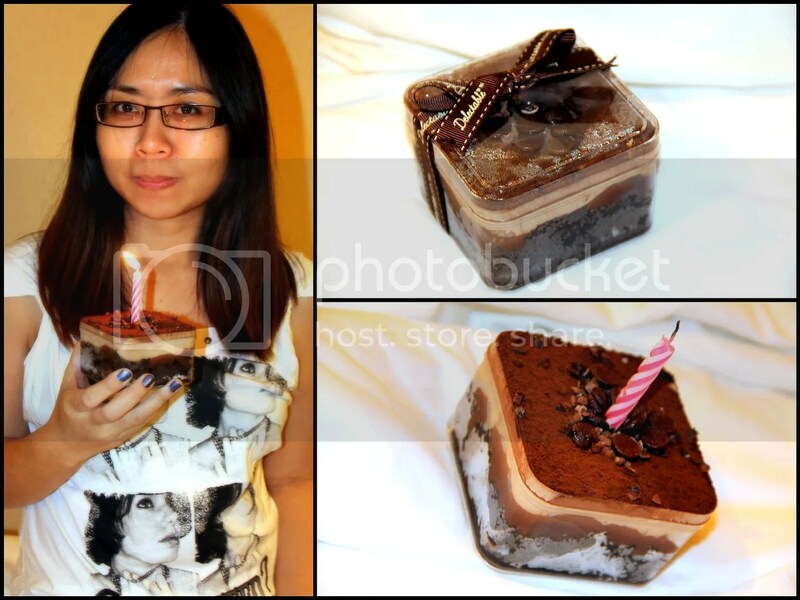 Bought a delicious Chocolate Mousse birthday cake from RT Pastry House. 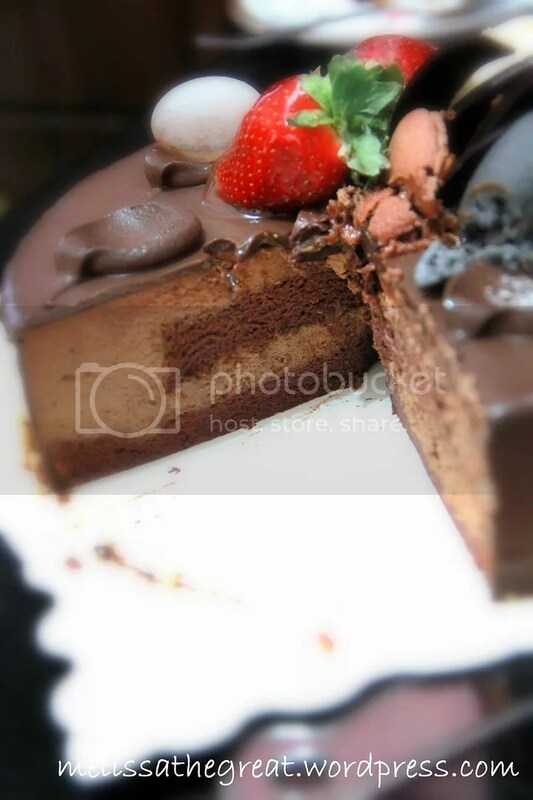 Fresh and moist chocolate mousse cake! Very nice chocolatey taste. We all love chocolates! 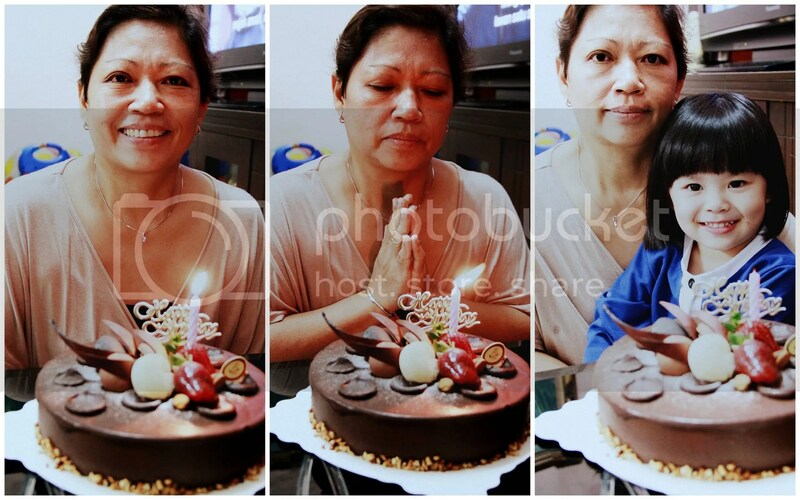 Happy Birthday Mummy Dearest. Wishing you lotsa happiness and good health! On Sis’s birthday, I suggested to mom that we make a simple dinner at home. I guess nothing beats a comfort home cooked food! I then told mom, why not we make hamburg from scratch. Mom agreed to it. I think I’m in love with hamburg after trying one from Waku Waku. hehe…. 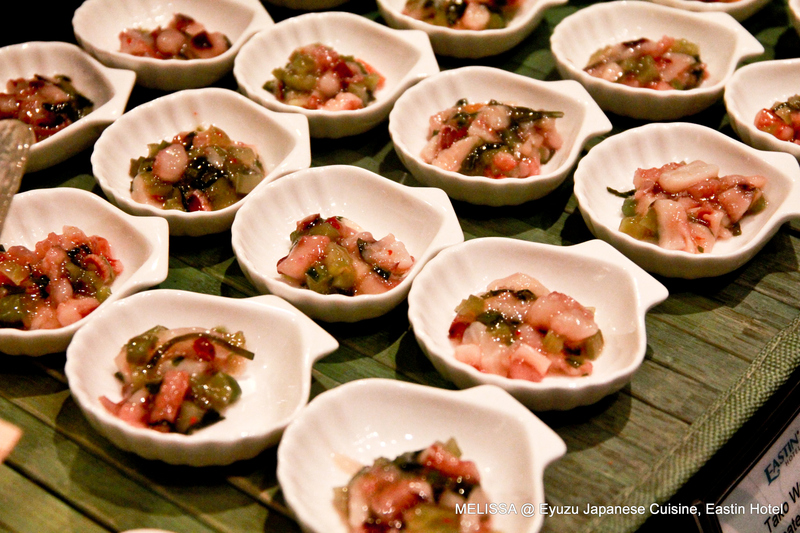 I was looking for the recipe, then I recalled Baby Sumo did blog about it. 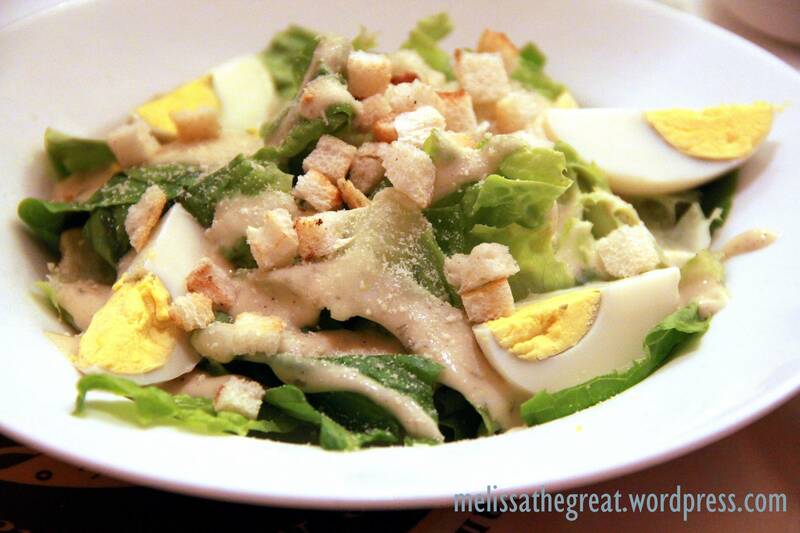 Here’s the recipe from Baby Sumo. 1. In a frying pan over medium high heat, add a tablespoon of vegetable oil and sauté half the onions until golden brown and caramelized. Allow to cool to room temperature. 2. 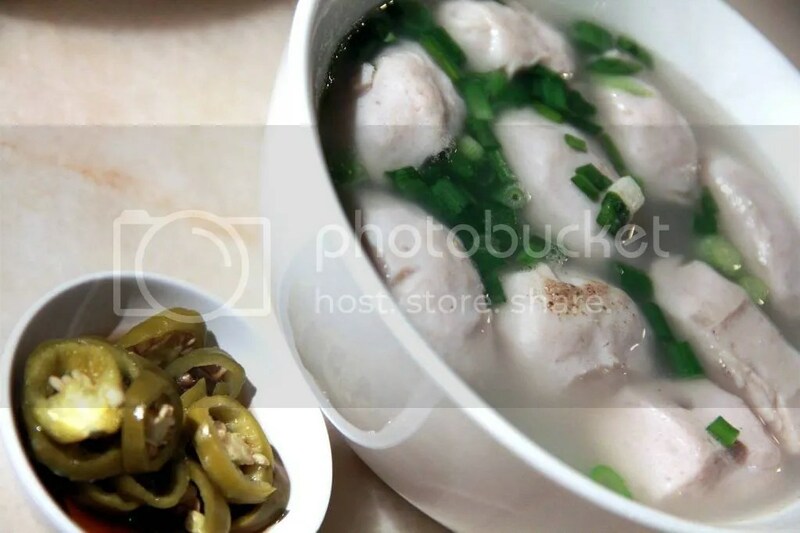 Combine the pork, tofu, sautéd onions, raw onions, garlic, fresh breadcrumbs and crackers, egg, ketchup, oyster sauce, parsley, soy sauce and black pepper in a large bowl. Put some disposable gloves on and knead the mixture together until it is uniform in color and texture. 3. Add a little bit more oil to the frying pan that you fried the onions in and place over medium heat. Because the patties are on the soft side, you’ll want to form them and add them directly to the pan. The patties should be around 1″ thick. 4. Fry them until they’ve formed a dark brown crust on one side, about 1 1/2 minutes then use a spatula to carefully flip them over and brown the other side. Unless you have a very large pan, you won’t be able to do them all at once, so fry 4 at a time and transfer them to a plate when they’re browned on both sides. Don’t worry if they’re not cooked all the way through as they will finish cooking in the sauce. 5. After you’ve fried all the patties, drain off any excess oil (but don’t wash the pan as the brown stuff is what will give your sauce flavor). Add the chicken stock and boil until it’s reduced by about half in volume. Add the ketchup, water, Worchestershire sauce, and demi-glace (if using) and stir to combine. The shaped up patties that are ready for frying. 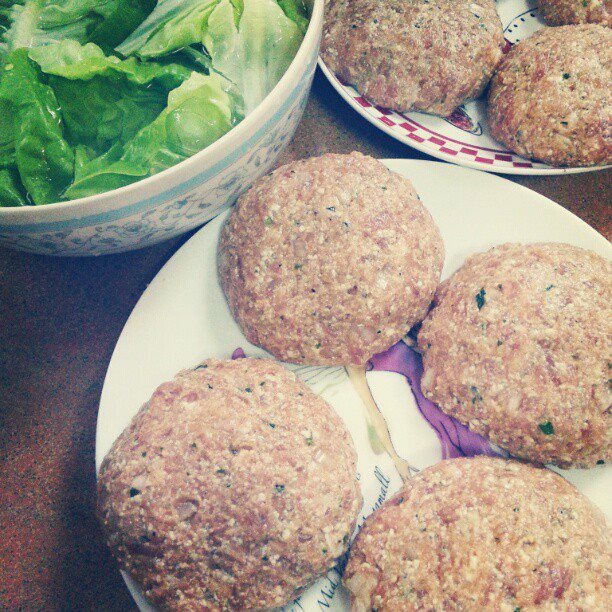 With the help from mom, we made this hamburg steak. 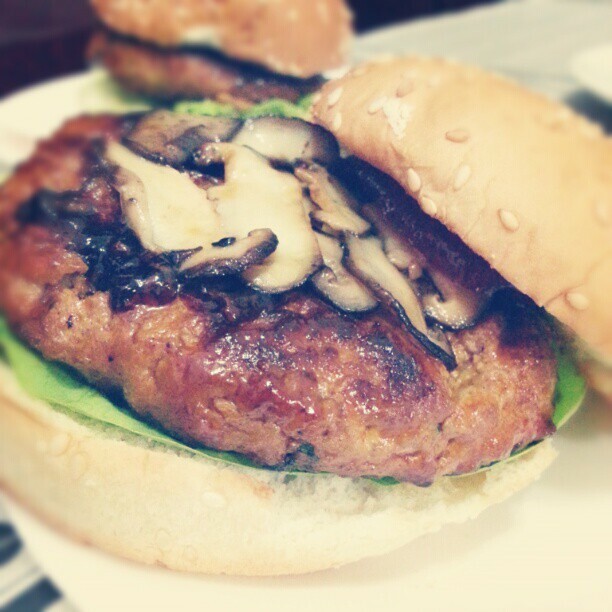 Eaten as burger! 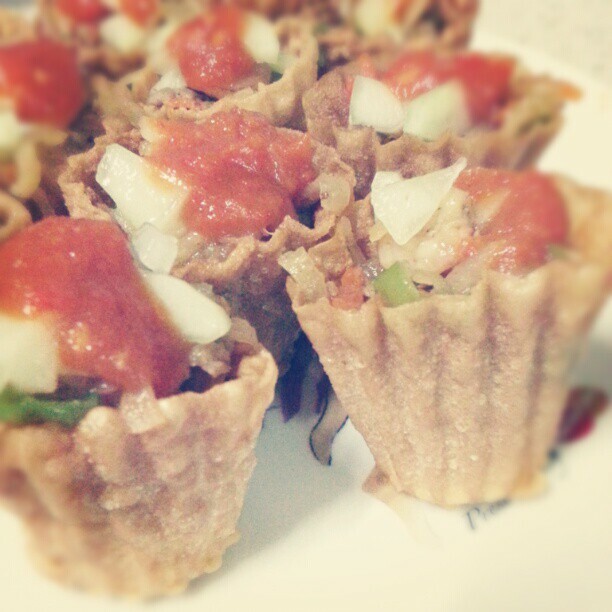 Mummy’s hardwork on these Pai Tee. It was her 1st attempt. No wonder those selling in restaurants are expensive. To fry the mould/hat is quite tedious. 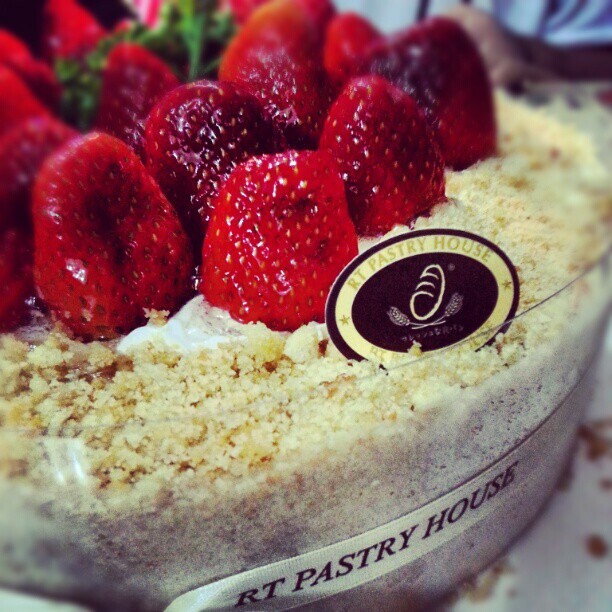 On Sis’s birthday 2 weeks ago…we had this Strawberry Tart from RT Pastry House. 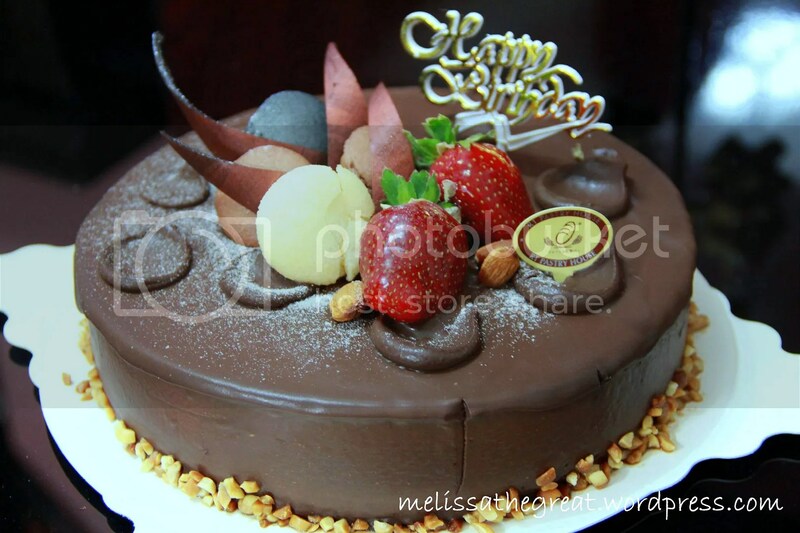 If you are a fan of Mousse cake and a fan of white chocolate, I’m sure you will love this. Smooth white chocolate mouse with a thin layer of sponge cake and biscuit crumbs coating the whole cake. The cake is very fresh! But the strawberries are quite sour. Hahaha….8in (1 kg) for RM63. 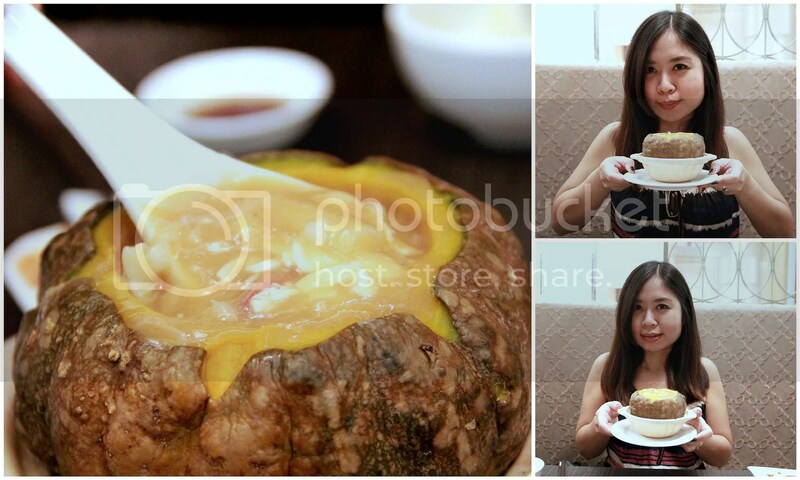 The so-called ‘food marathon’ to celebrate my birthday! Our initial plan was to eat, window shop and watch a movie. I was suppose to wake up at 9.30am. And as usual I will wake up earlier then Alex…because I very ‘MO’. We also planned to go out at around 10.30am. Unfortunately….I missed the alarm, I overslept and suddenly awake, realized it was already 11.30am!! OMG!! We’ve missed our breakfast session!! I brought along my copy of Worthy Book and decided to utilize it. 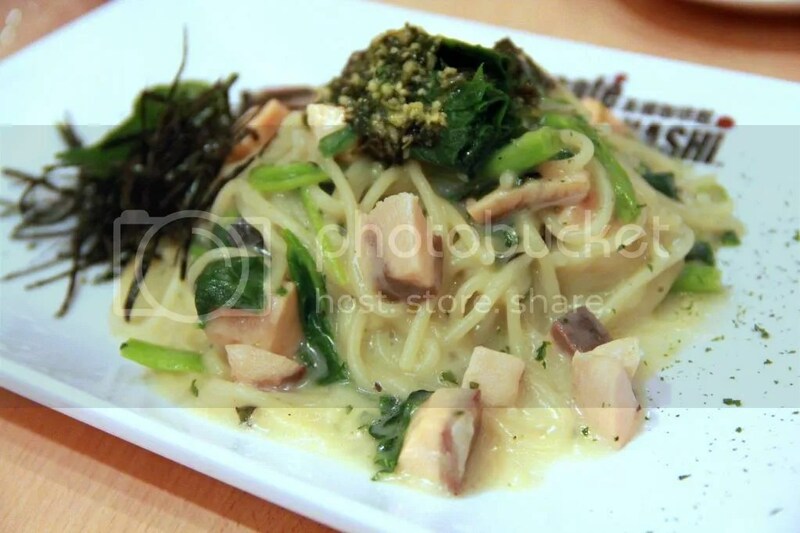 Café Takahashi is a Japanese ala Italian restaurant. 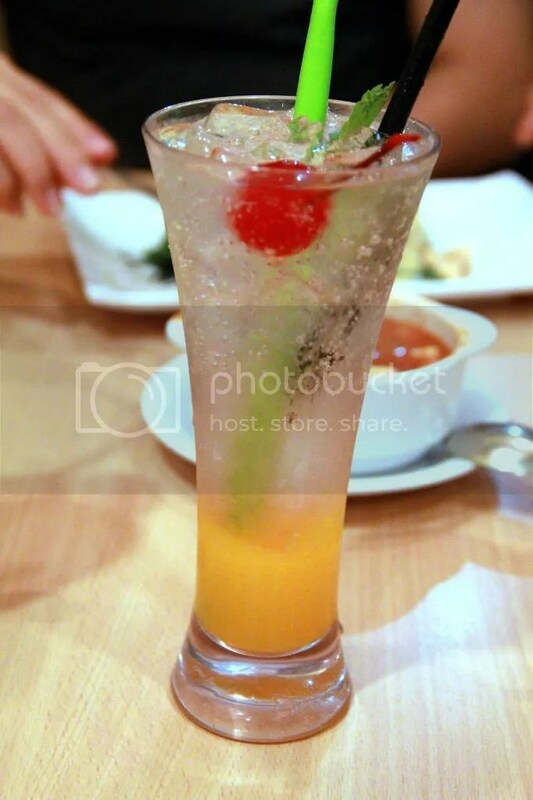 Ordinary soda drink with mango flavor puree. 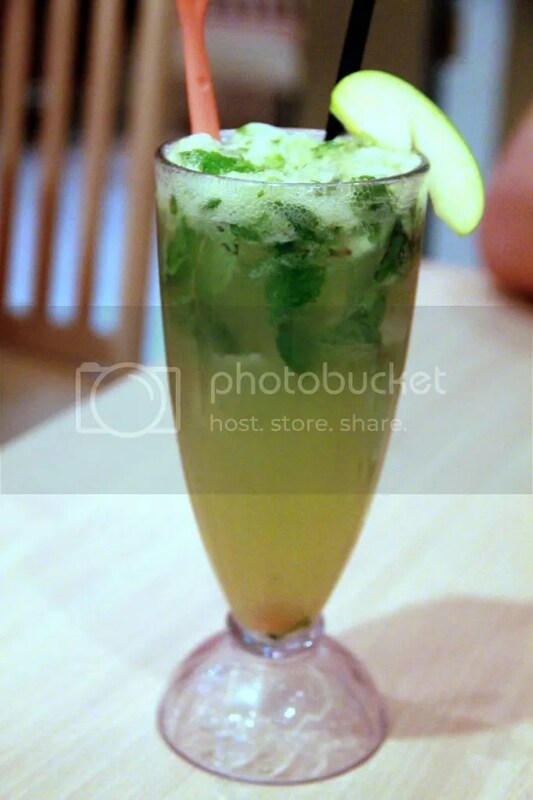 The Mojito is not as good as the one I had from Bumbu Bali. Not a memorable pasta I had. Unlike the one I had from The Vanilla Place. 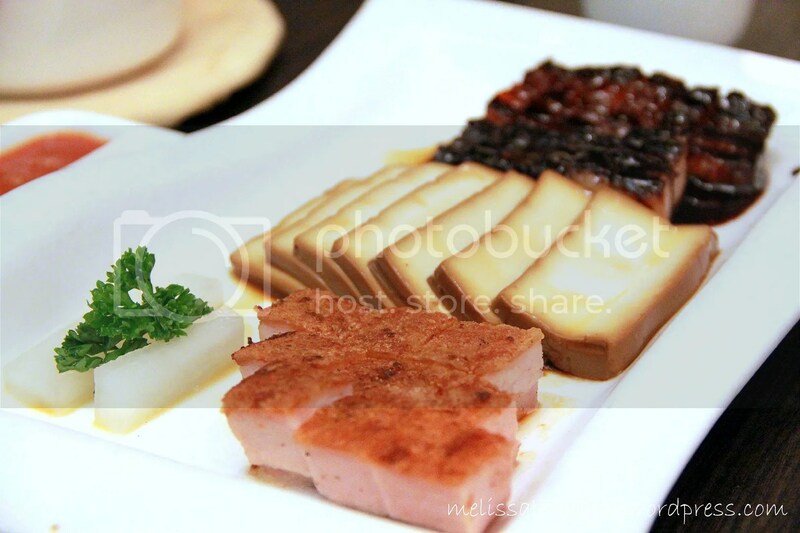 I reckon the slices of smoked duck was good. Nothing more. 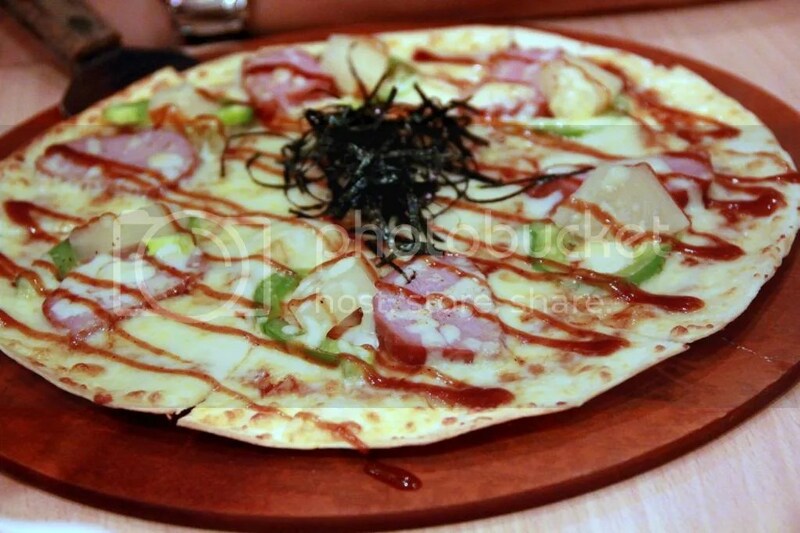 The thin crust not as good as the one I had from WATAMI Japanese Casual Restaurant. I reserved some space for my after meal dessert. 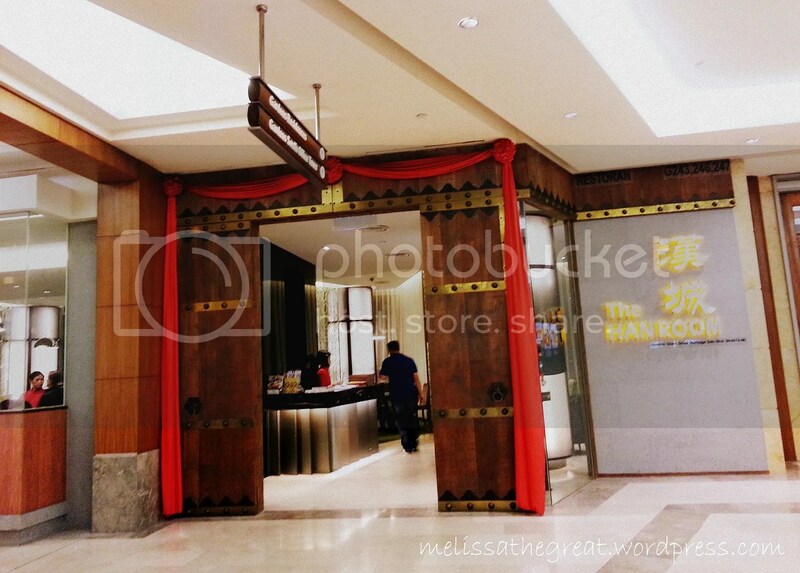 I heard many people commenting about Hui Lau Shan when it first opened at 1 Utama. 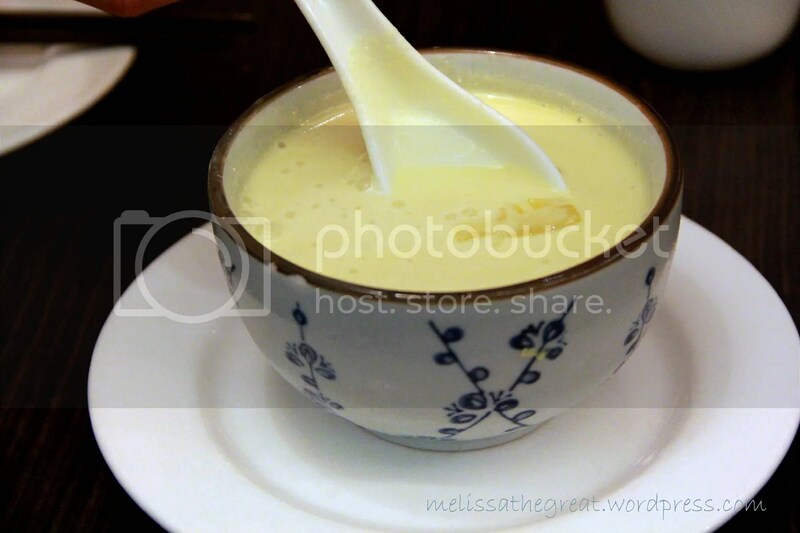 HLS is Hong Kong’s popular dessert chain. 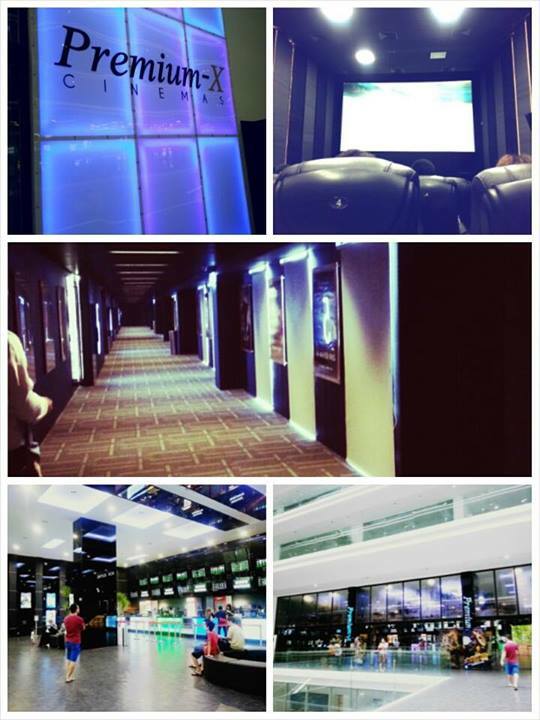 HLS Pavilion is their 4th outlet in Malaysia. Too bad that I’ve not tried the original ones in Hong Kong. Therefore I can’t make the comparison. ideal for 2 eaters and mango fans. 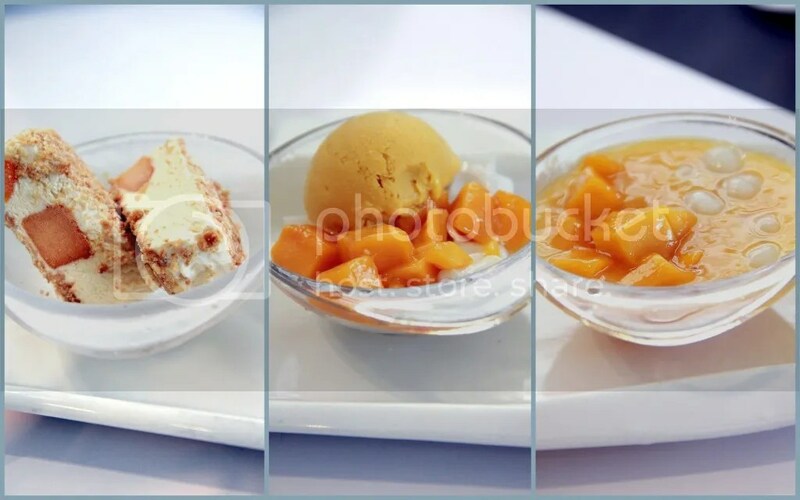 (From Left): Vanilla ice cream bar with mango cubes coated on biscuit crumbs, Mango ice cream and mango cubes on coconut flavor jelly strips (like chee cheong fun), Mango Cubes and glutinous rice balls in mango puree . Purchase 1 Regular Cup, Free 1 scoop. 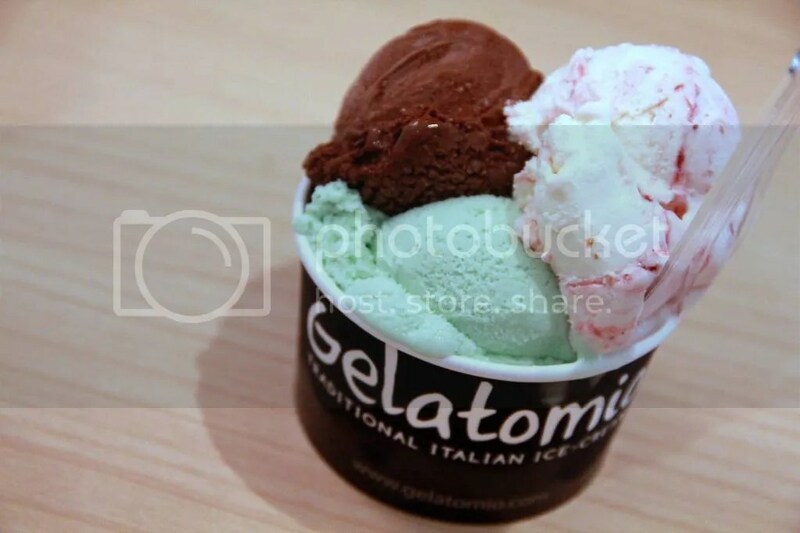 I got 3+1 scoops of creamy and dense gelato for RM10.90. If you can’t take milk, they have soy based ice cream too. 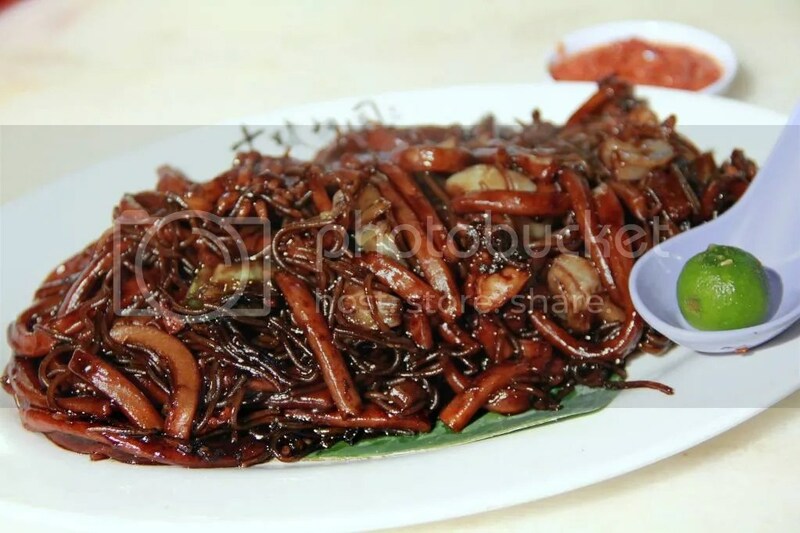 Glossy and cukup hitam is my choice of hokkien mee. And of course with the sufficient ‘wok hei’. 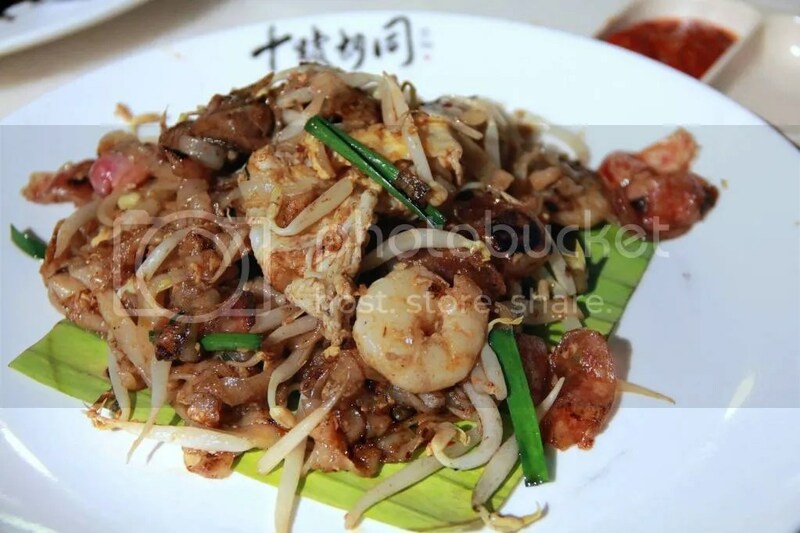 A plate of char kuey teow consist of Chinese sausages, plump juicy cockles, fat bean sprout and 2 pcs of average size prawn. 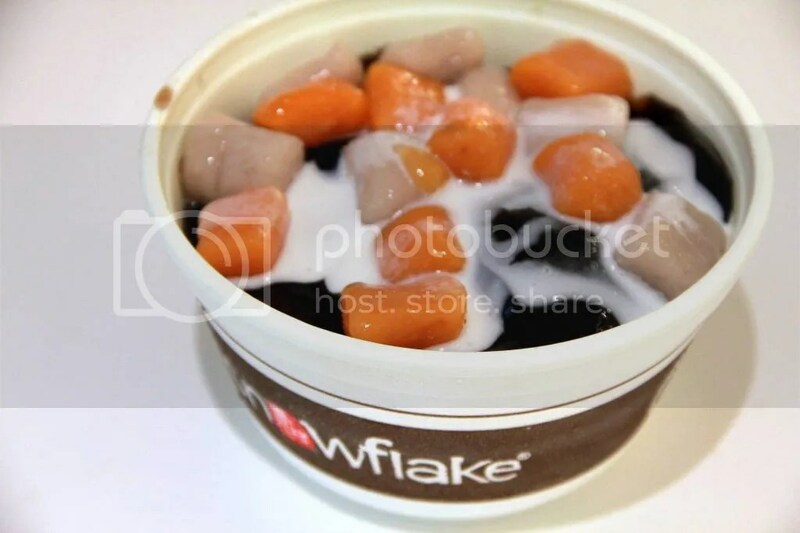 To call off a day, we went to Snowflake, Taiwanese dessert. Its one of my favorite pick here. Grass jelly shaved ice topped with Taro balls and a layer of grass jelly. Yesterday was my birthday. I’ve just step into the age 30s! Wow…I couldn’t believe it lor…The Big 3! 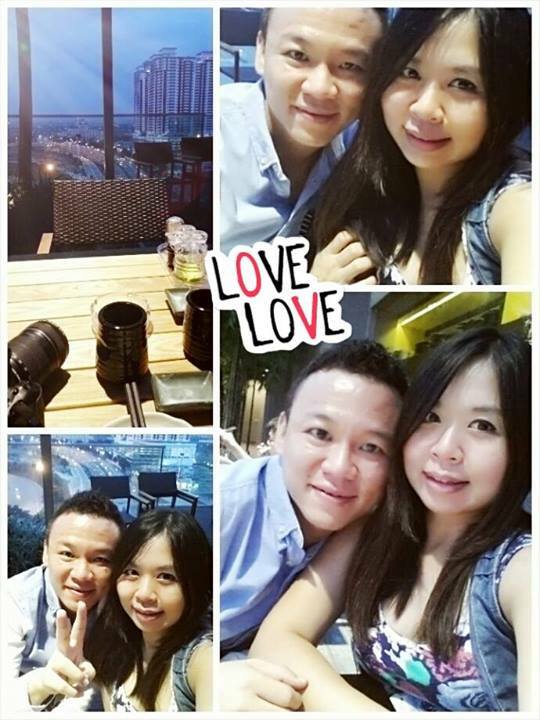 HB said…3 jiong yeh* mou dak chau. (if you could understand canto). 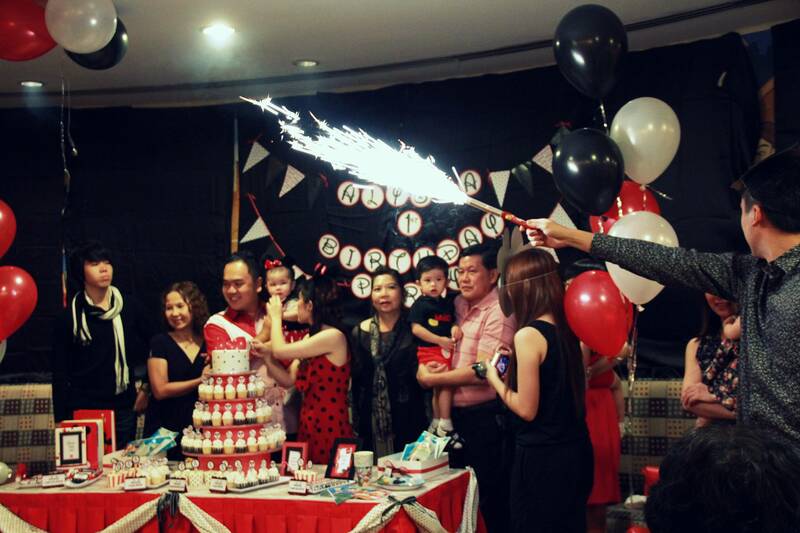 No grand parties…No grand celebration..But celebrated it with family and also HB, that’s more than enough. 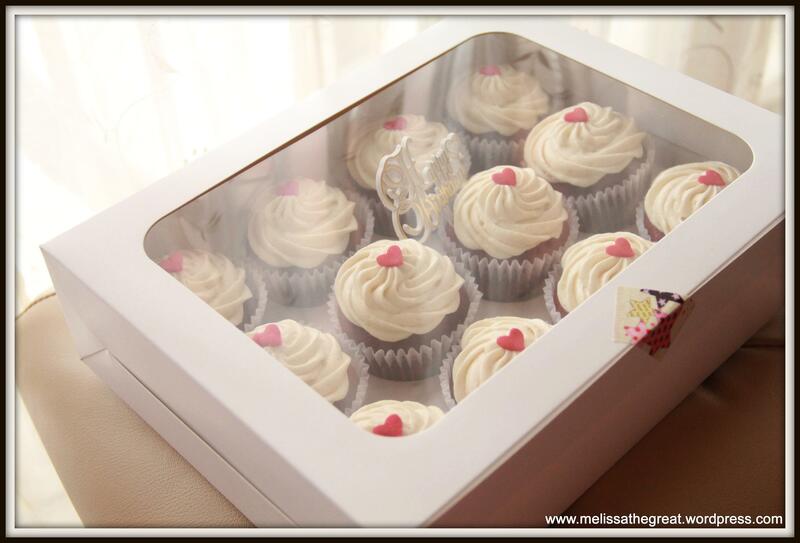 These cakes are from ‘Just Heavenly’. 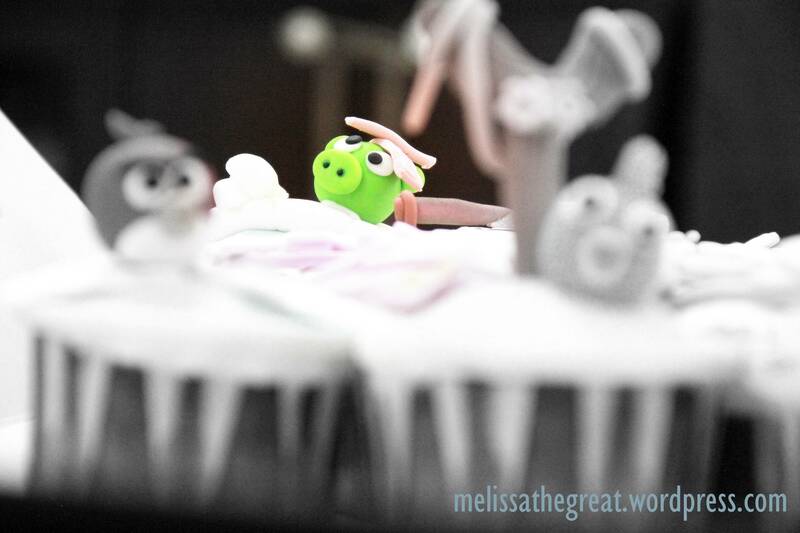 I got to know about their cakes through Cherry@Monkey and Baby Sumo. They mentioned that their cakes are good. I told HB much earlier that I wanted these cakes for my birthday. I did not choose whole cake because I wanted to try more flavors. Too bad the ‘red velvet’ was all sold out. (From left to right) :- Death by Choc, Black Forest, Choc & Cheese. 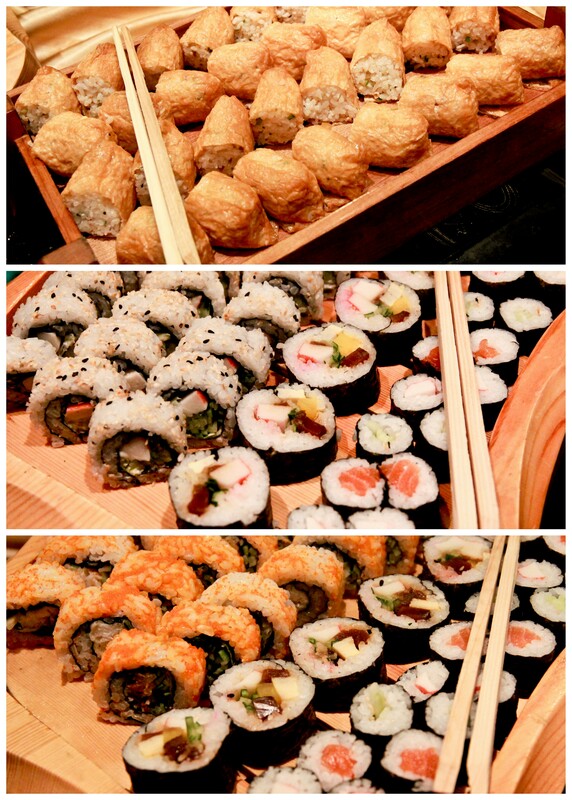 All of them tasted so goooood….Fine, light and moist. Moreover its not too sweet. Ya..you do notice or curious why are all chocolate? Reason is that, I am a chocolate lover. I was seriously drown with ‘Death by Choc’! 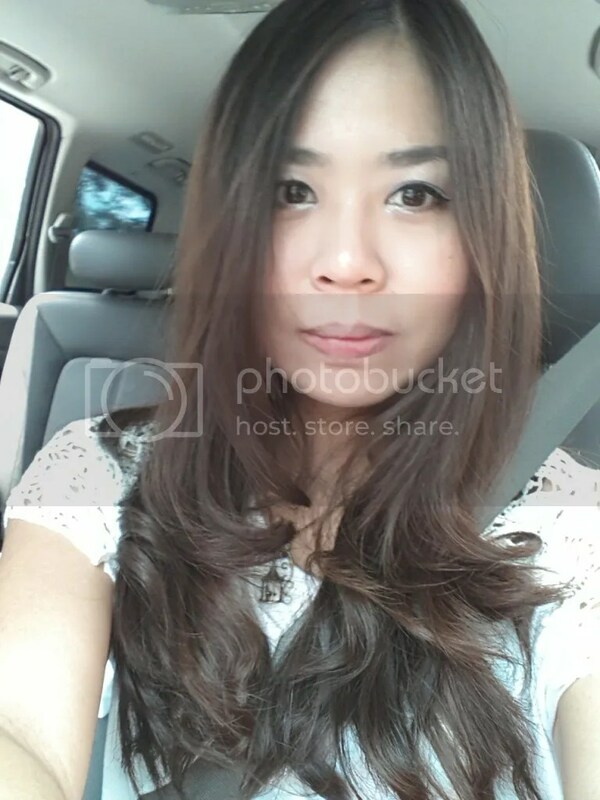 When I was in mid 20s….so young! & oso slim…. Happy Birthday to me. If you ask me did I had a good one. Yes..I did! 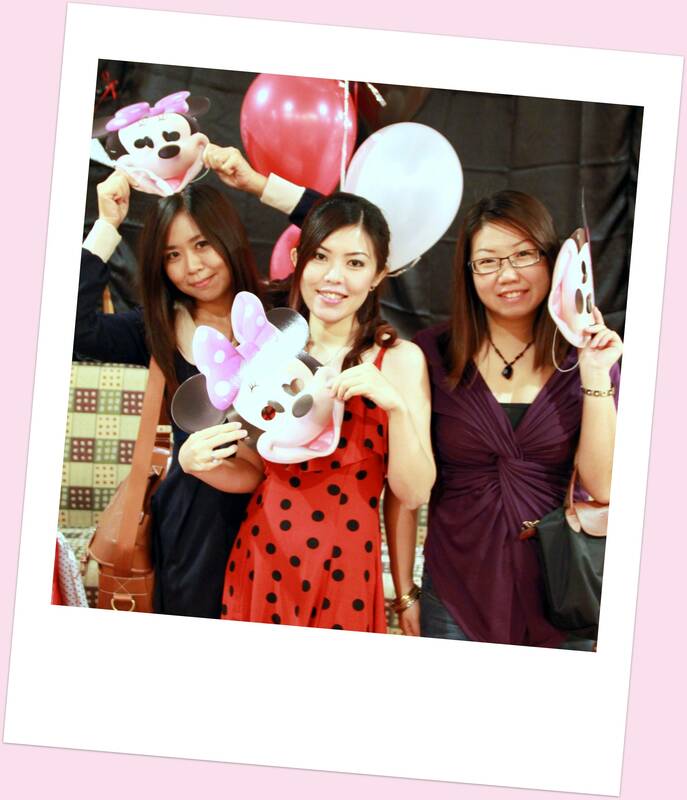 Two weeks ago, Sin Wei invited me to her daughter’s 1 year old birthday party at Royale Bintang Seremban. 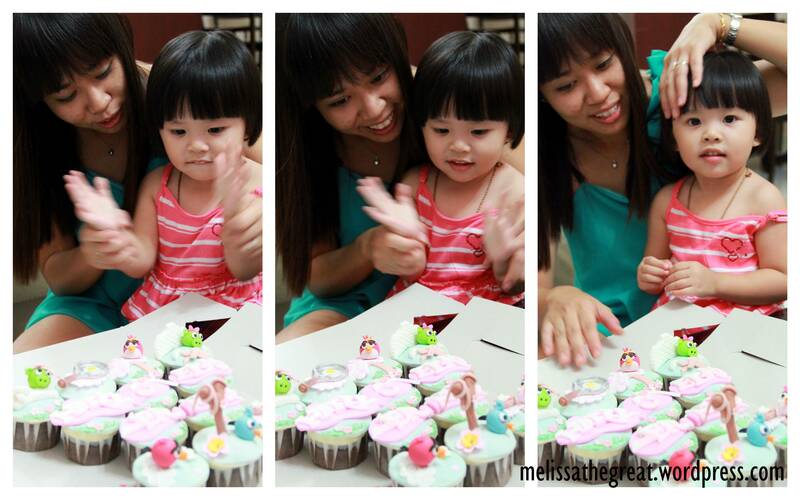 Time flies…so fast Baby Alysha is now 1 year old. I can still remember the day she was born and then fullmoon, where I took some portraits of her. Makes me wonder..children these days grows really fast. Hence watching their growing stages is the most memorable ones to every parents. 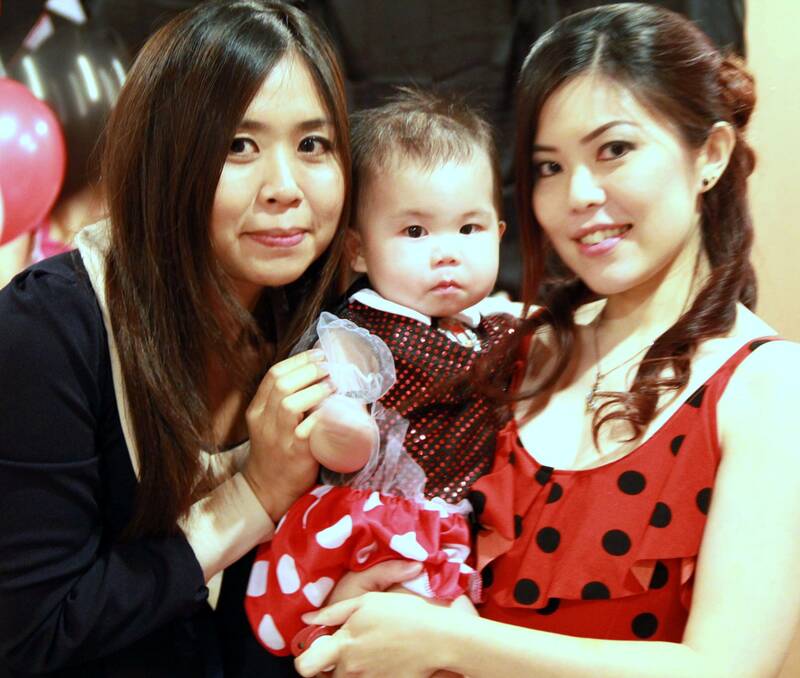 When she was 1 month old……. 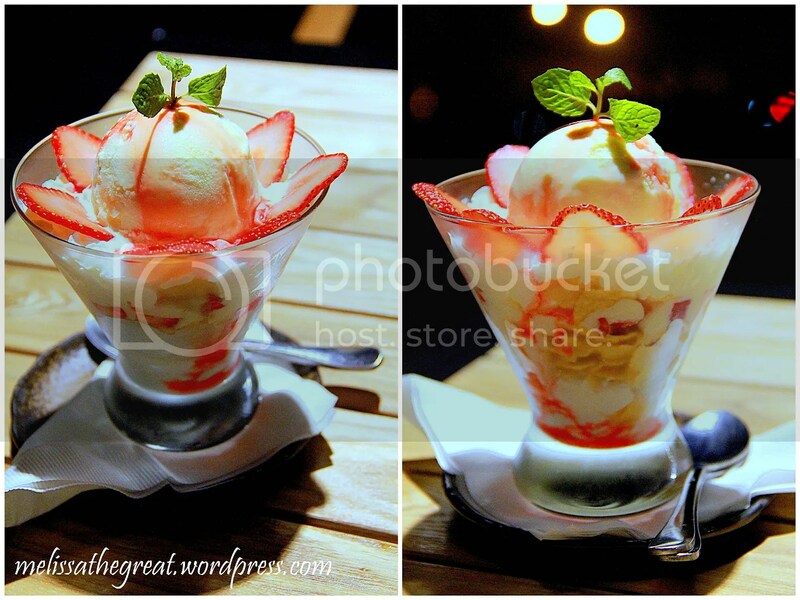 The birthday celebration was held at Asiatique Restaurant. 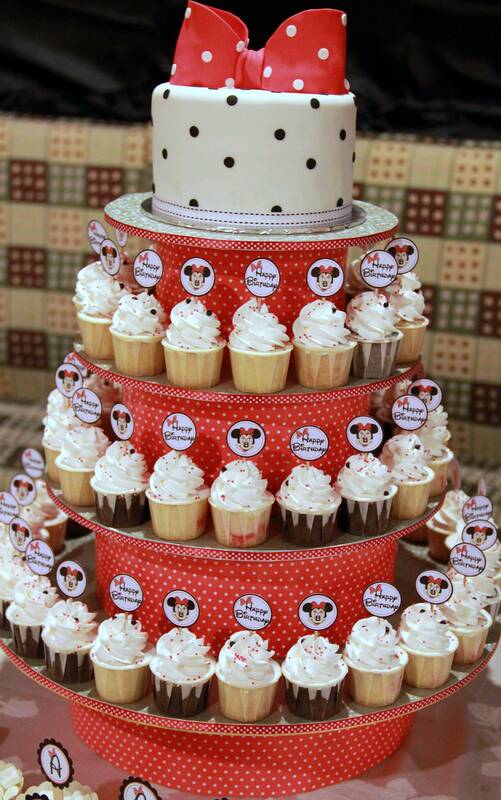 Mickey & Minnie Theme for the birthday gal. 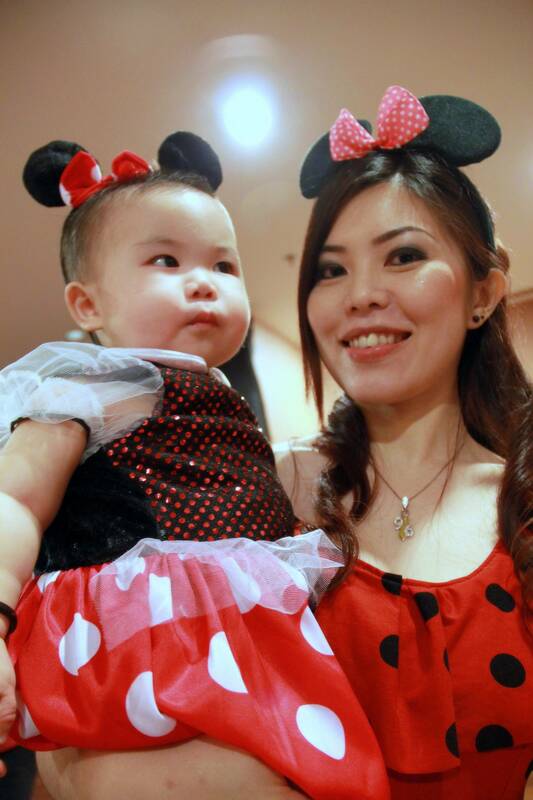 Hhmm…mummy really puts alot of effort for tonight. 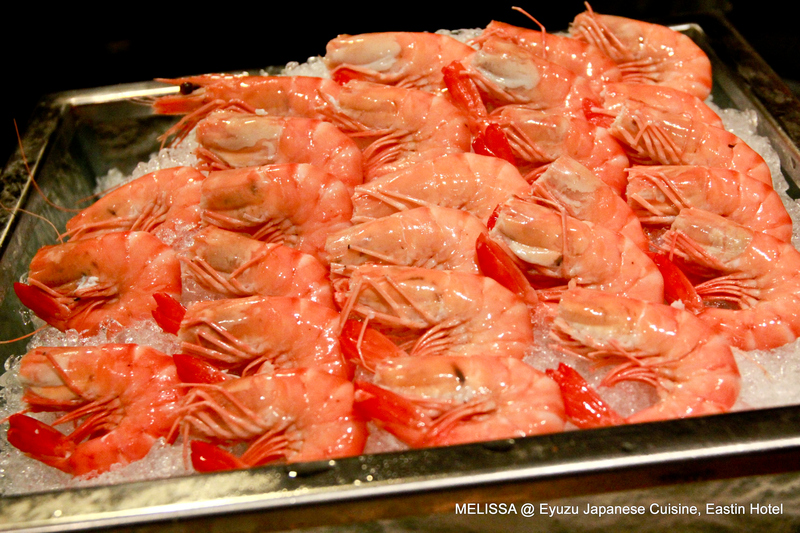 It was a buffet dinner. 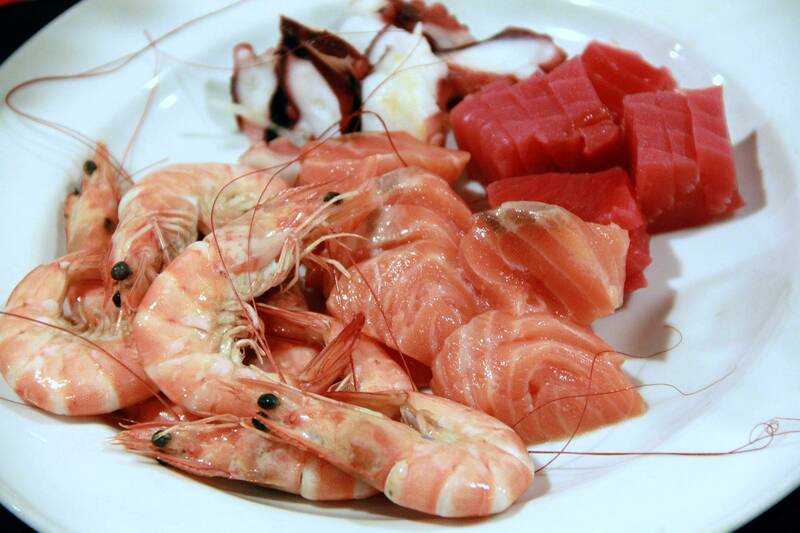 So, I started with a plate of fresh sashimi. 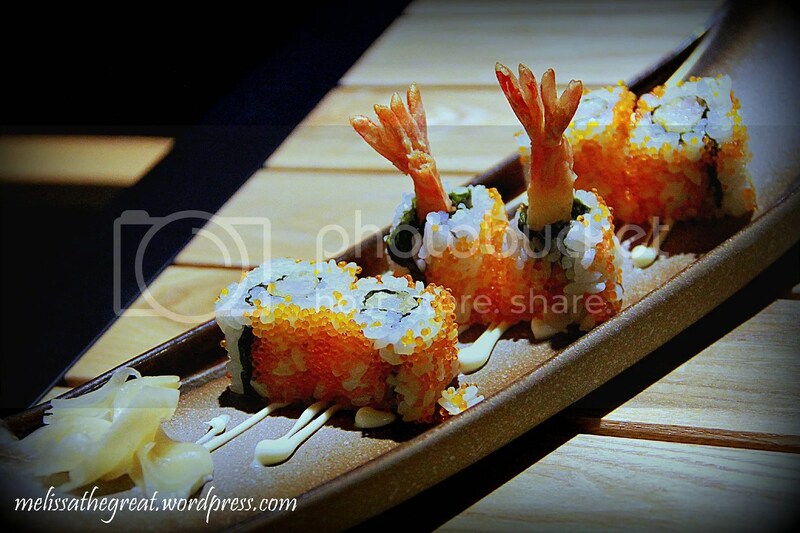 Salmon & tuna was very laku. 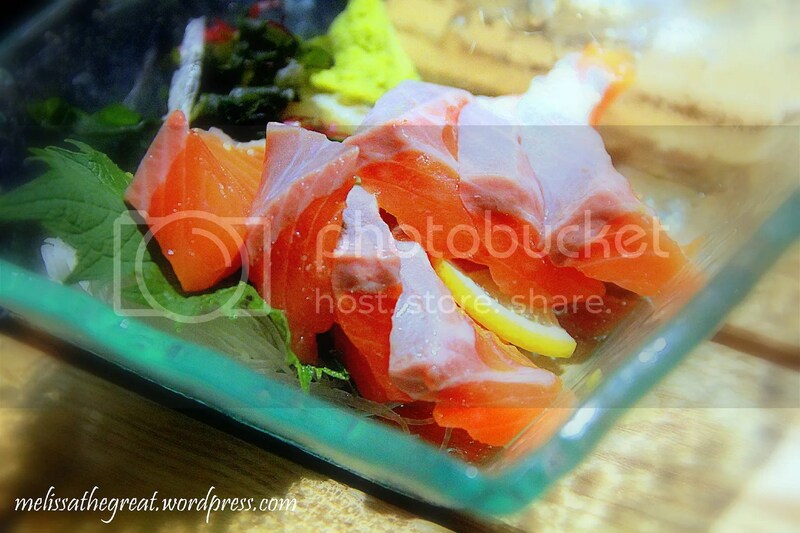 When I took an empty plate to fill…all salmon & tuna finished. Leaving only octopus. No choice but to ask the staff to replenish. 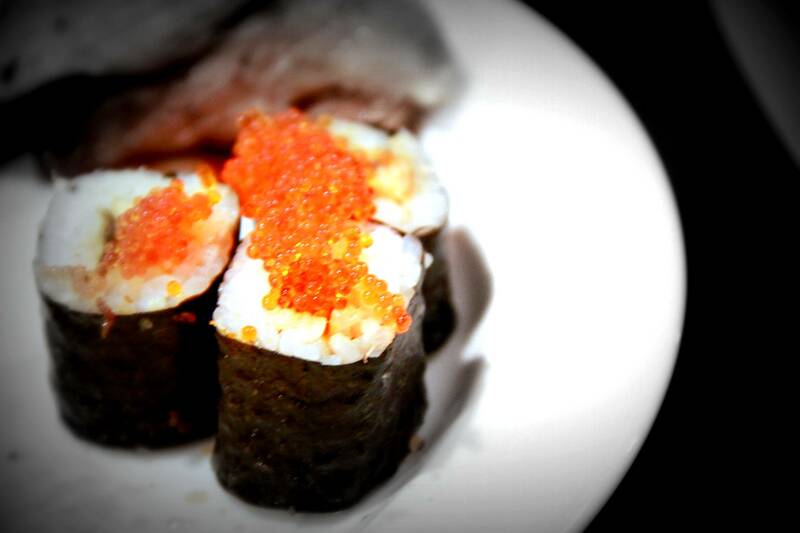 I topped the sushi with some golden fish roe. 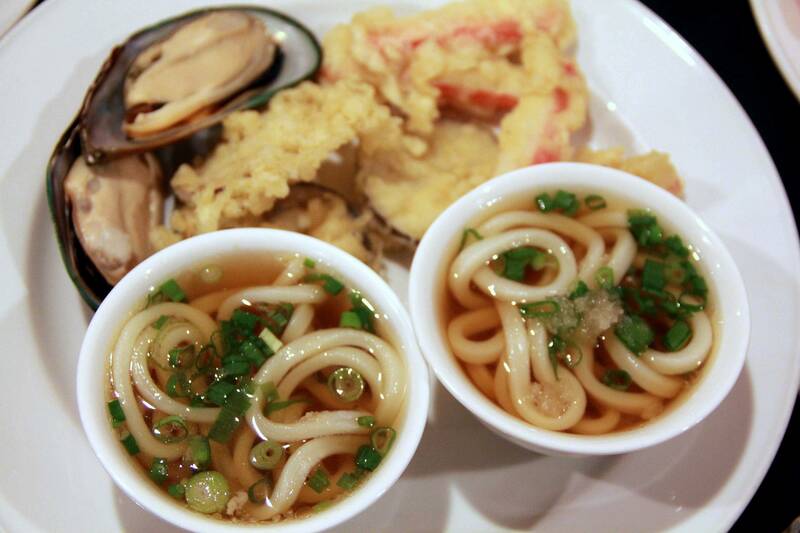 Udon, Tempura & Mussels. There were also some BBQ food. 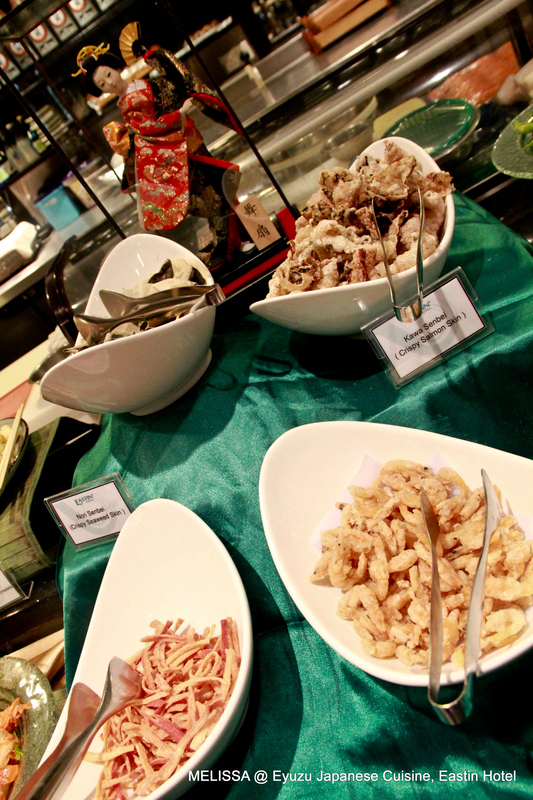 However the buffet dinner was just average. Lets sing a birthday song for the birthday gal. 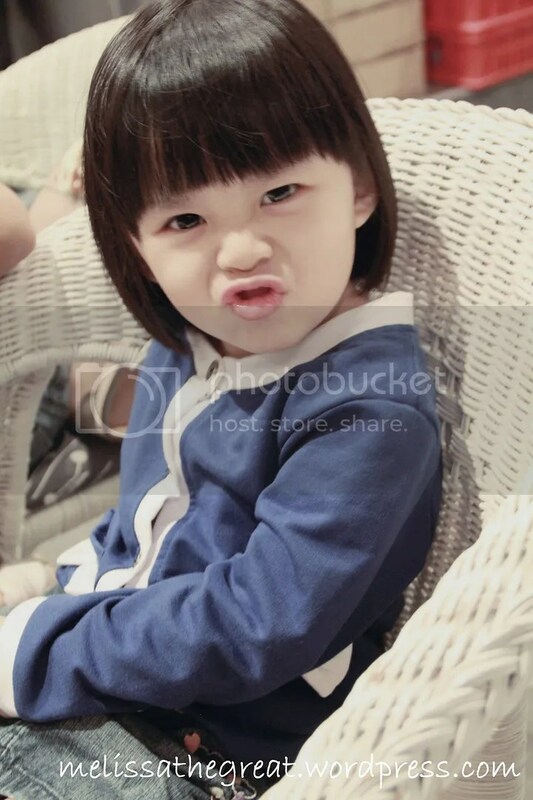 Alysha is so chubby and cute..feel like cubit-ing her. A photo of me & HB. 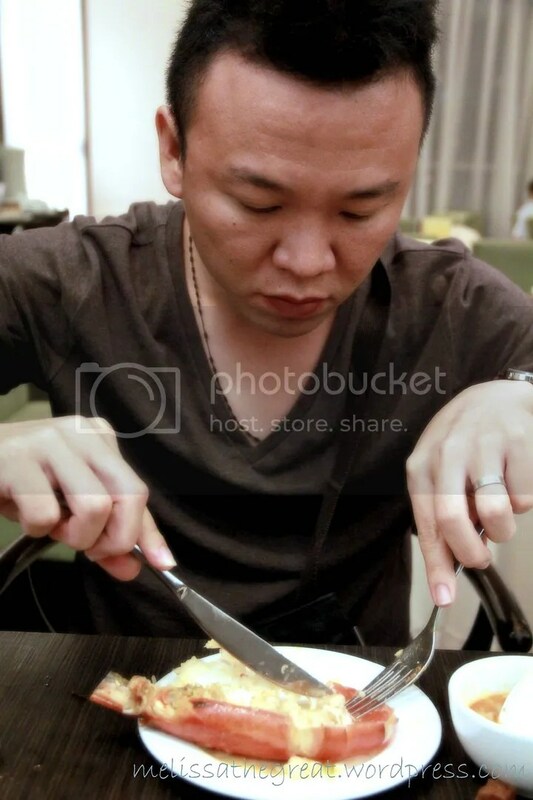 Ahemmm….how come HB looks like put on alot of weight in this photo?? Shhhh..I think is my bad …lately I fed him alot of food. 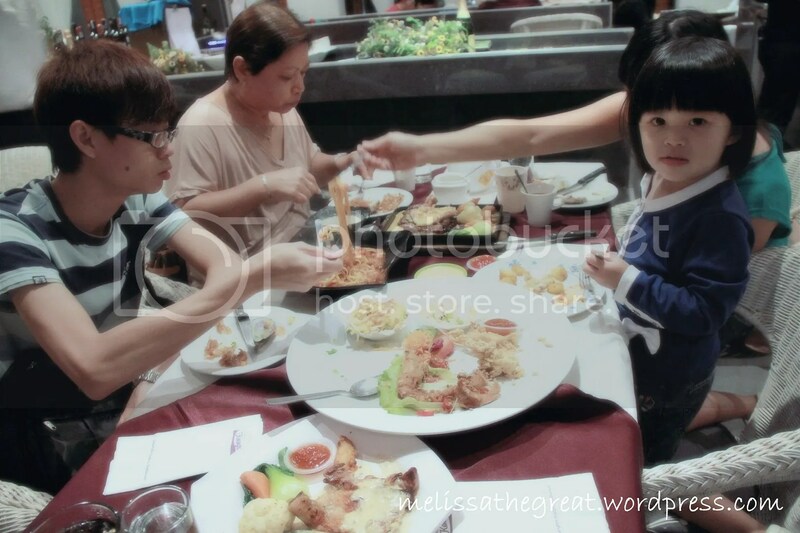 haha…But I think Mother in law will be happy to see that his son is well fed rite? ahahah.. HAPPY BIRTHDAY TO BABY ALYSHA!! 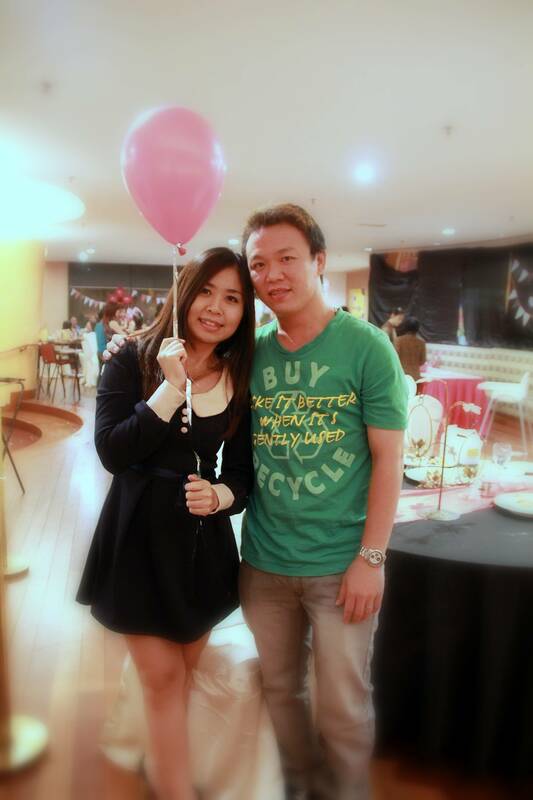 It was Vernice, my beloved niece’s birthday. 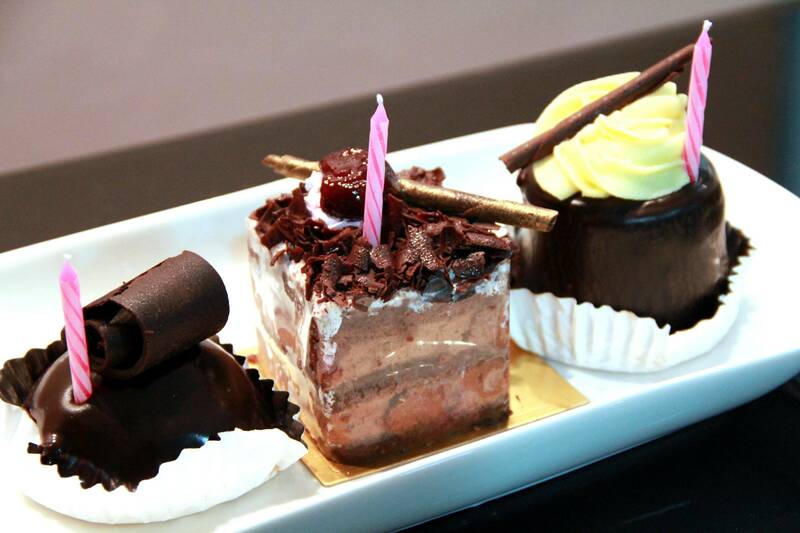 Vernice turns 3 on 25th of March. 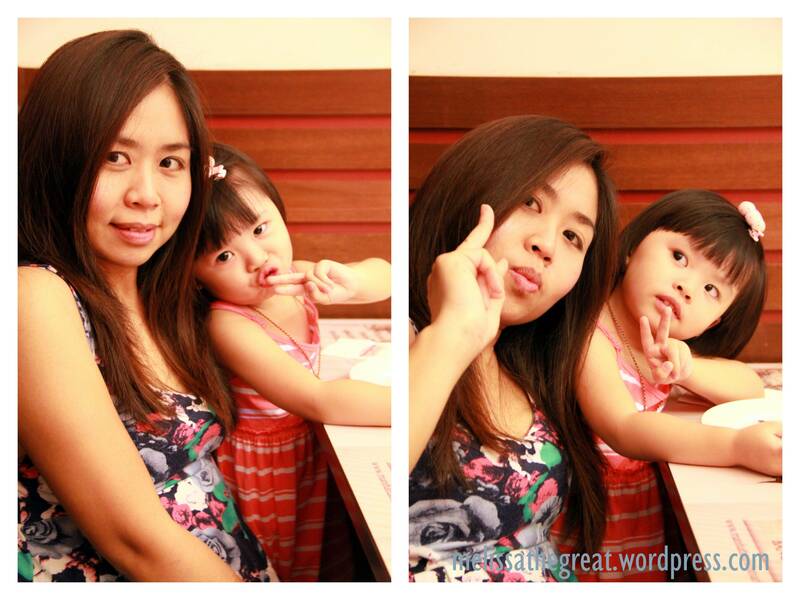 Her mom, my sis decided to celebrate Vernice’s birthday at The Manhattan Fish Market, Seremban. 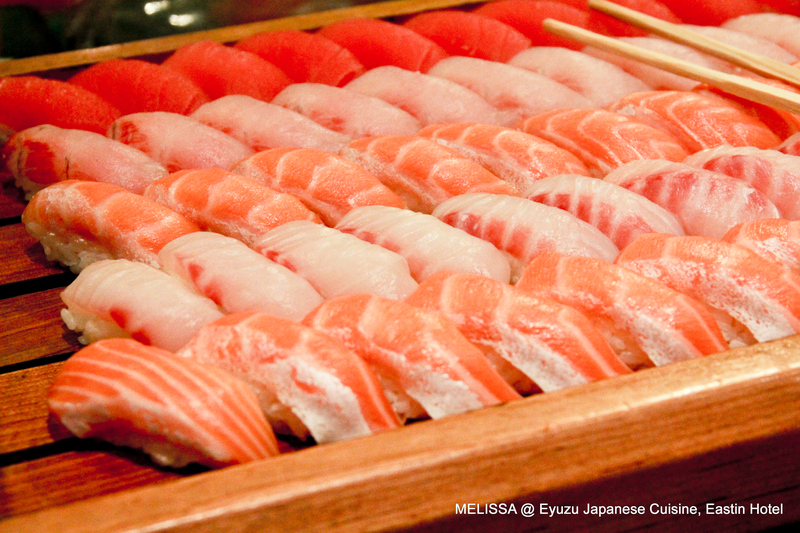 The Manhattan Fish Market is currently offering great savings set meals called “Greatest Hits From the Ocean” starts from 1st March to 29th April 2012. 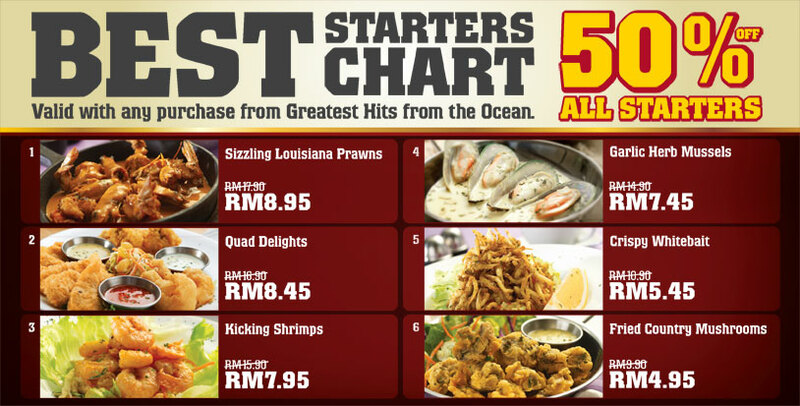 With every purchase of “Greatest Hits From the Ocean” , you are entitle to purchase these starters (shown above) with a discount of 50%. 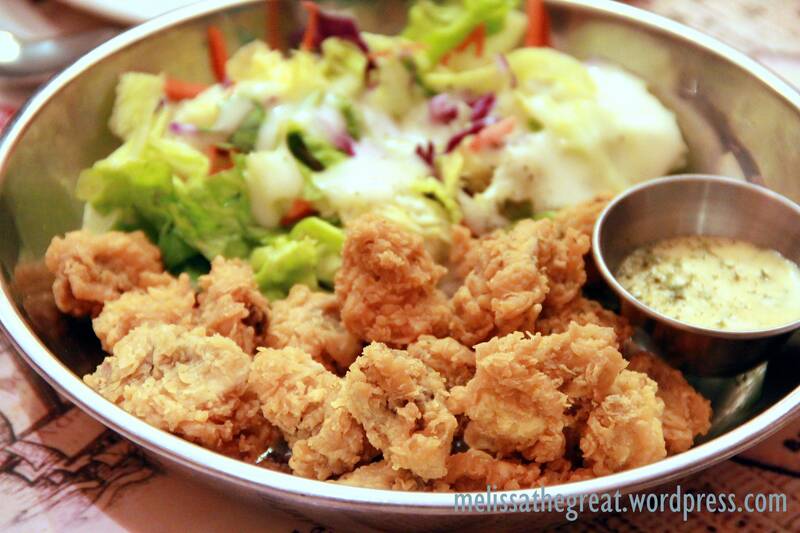 We decided to get 1 Fried Country Mushroom. Crispy battered button mushrooms served with Cajun Honey Mustard. 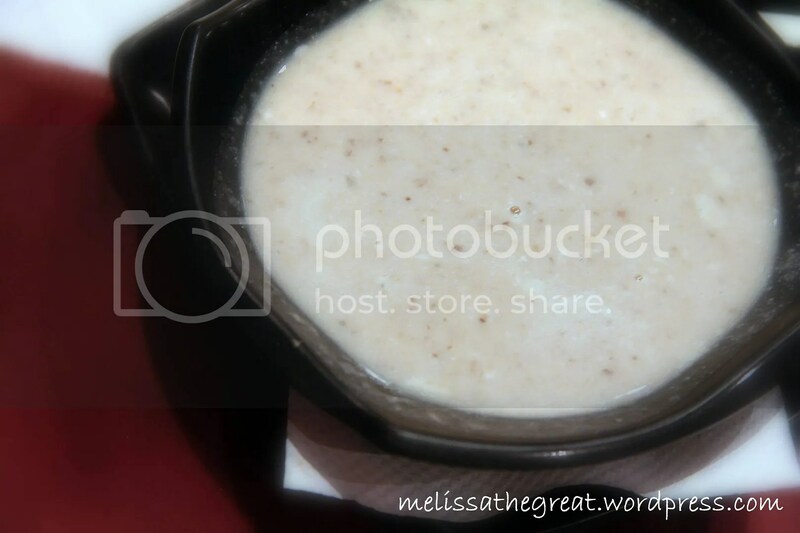 We also add on Cream of Mushroom Soup. Some said their standard of quality has deteriorate. However the food I had that day were all good. 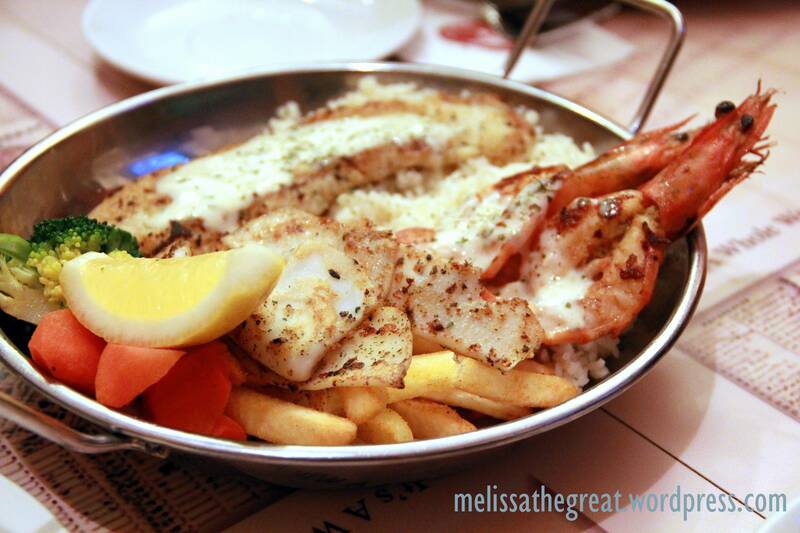 The seafood were quite fresh, especially the prawns. 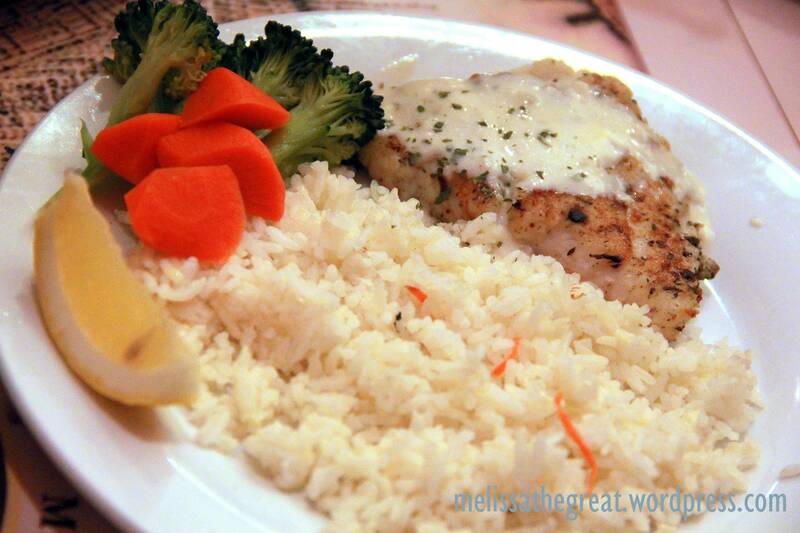 I specifically love the flavorful Garlic Herb Rice very much. 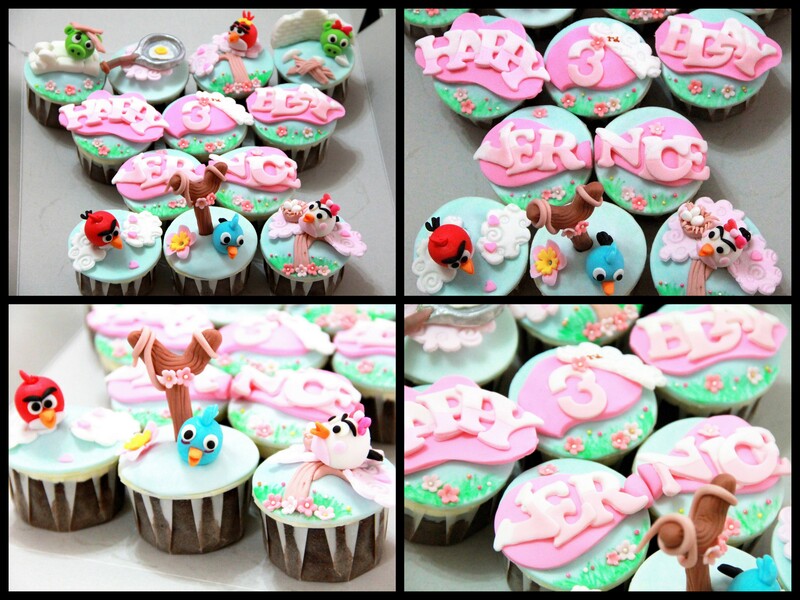 Sis ordered a beautiful set of cupcakes for Vernice. One of her favorite cartoon character, Angry Birds! 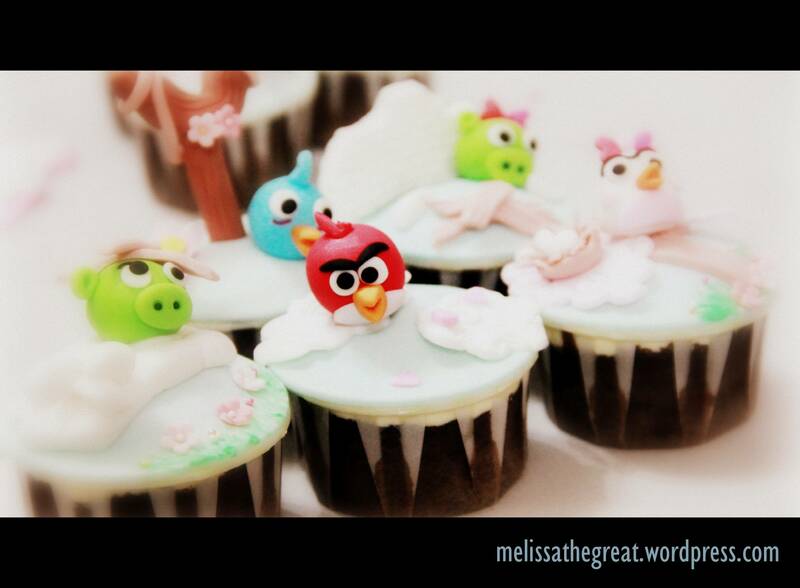 The thoughtful baker was creative to make them sort of more girlish after she knew its an order for a GIRL. Details are so neat. The chocolate flavor cupcakes were moist and the fondant was not too sweet either. 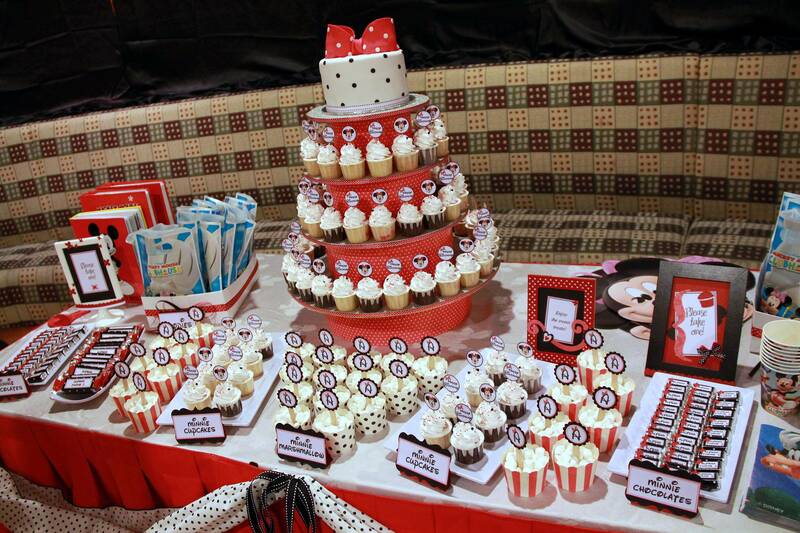 Check out her FB page (Thecupcakelicious – Couture Cakes & Gifts). 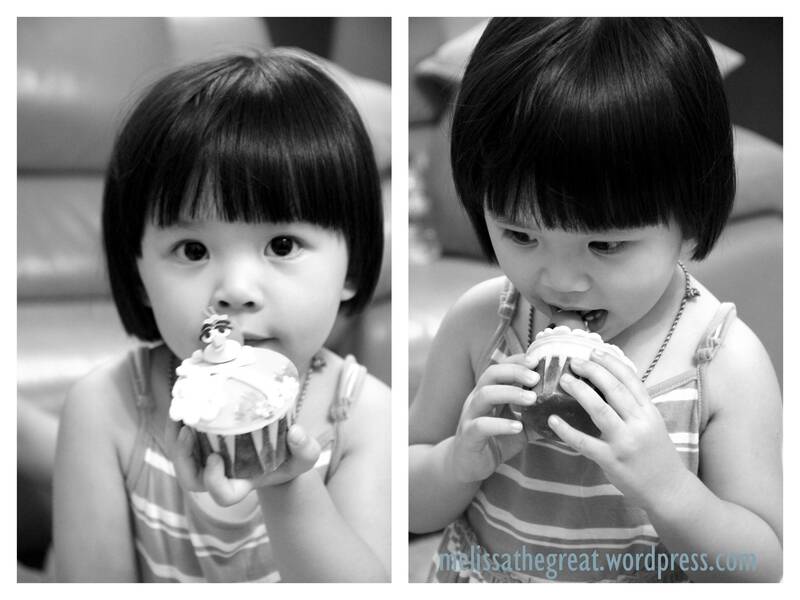 Her name is Leni…..a very pretty baker. Happy Birthday Vernice! ♥♥♥ you!!! 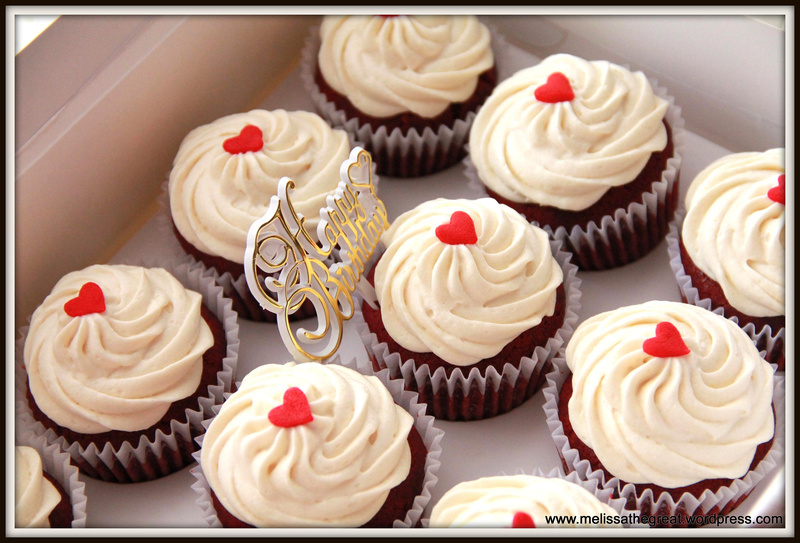 A dozen of standard size Red Velvet (Red mild chocolate cupcakes) with vanilla cream cheese frosting & red hearts. 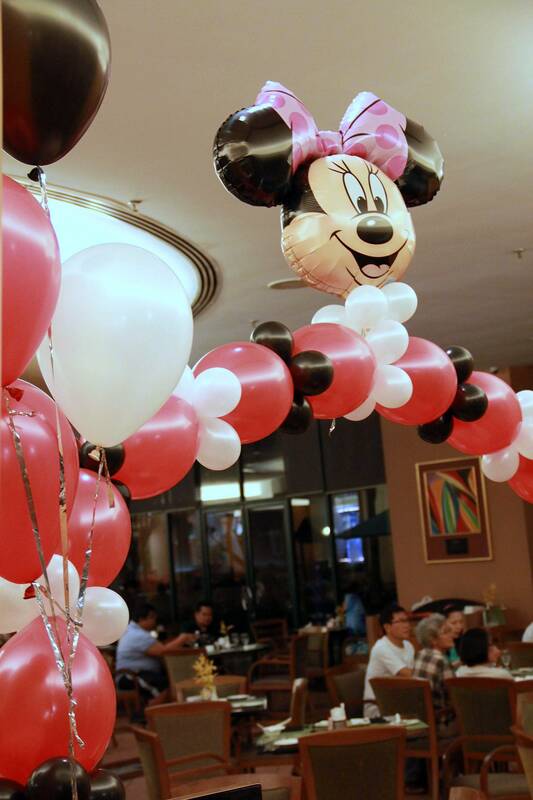 Ohhh….so thoughtful of her to place a ‘Happy Birthday’ stand. Cream Cheese Frosting is so much nicer than the usual Buttercream. Check out the brilliant color of Red & White! For standard size, its around 5.5cm base. 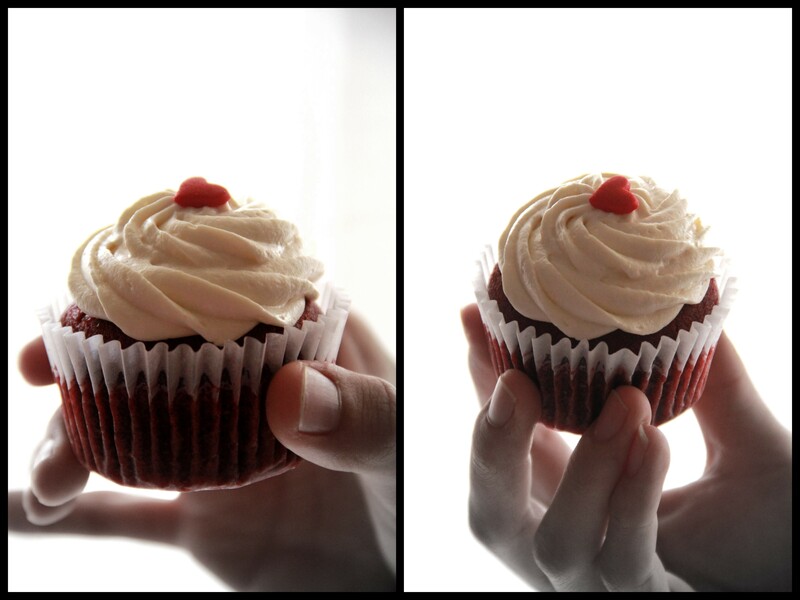 Look at the generous amount of cream cheese frosting…uuuhhh…I’m so loving it! Moreover the cake is so light and moist. 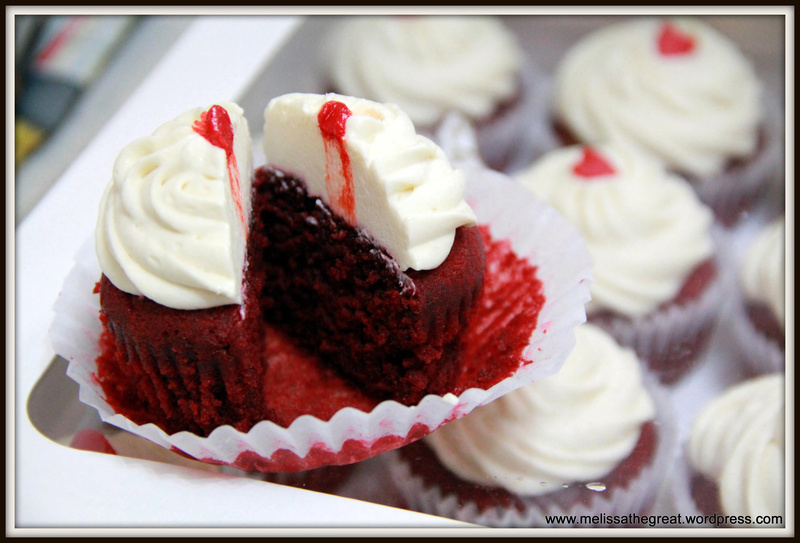 It balance perfectly together with the cream cheese frosting. Health cautious??? 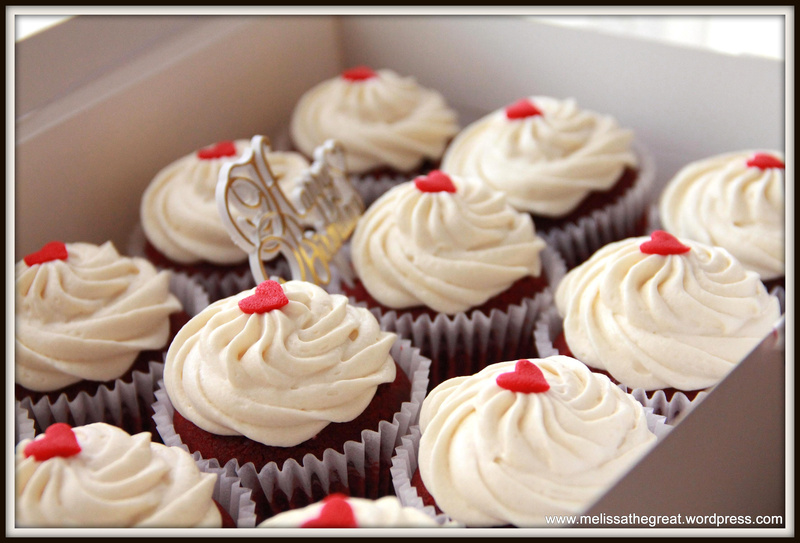 Worry not… the cupcakes are not too sweet. 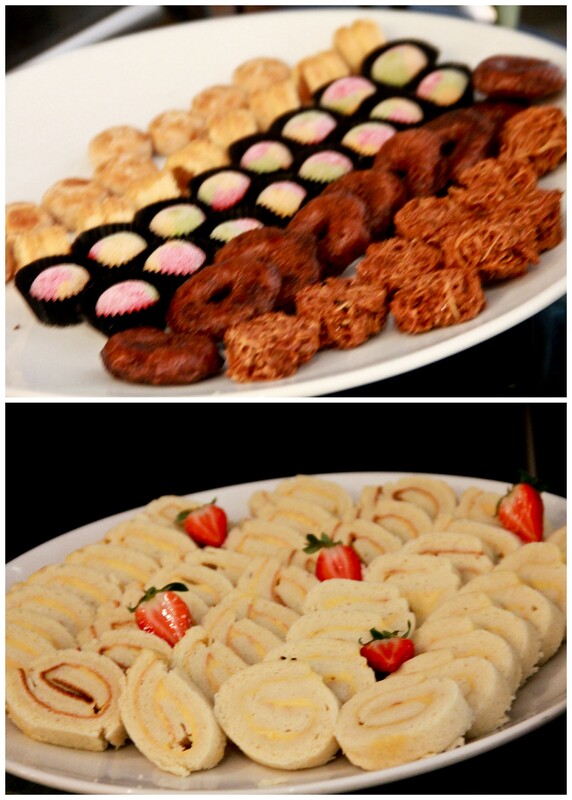 But if you have sweet tooth, then you might need to request for a lil sweeter. 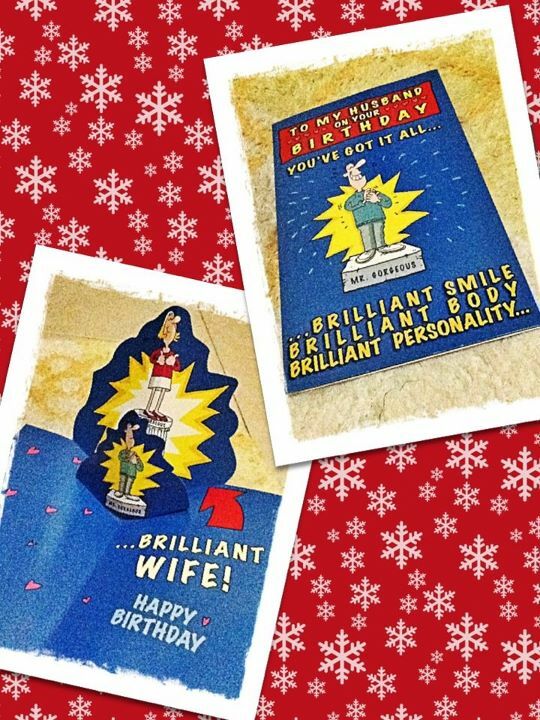 Not forgetting a birthday card for my beloved hubby from this lovely wife…heheh…. **Jocelyn, you’ve made great cupcakes! 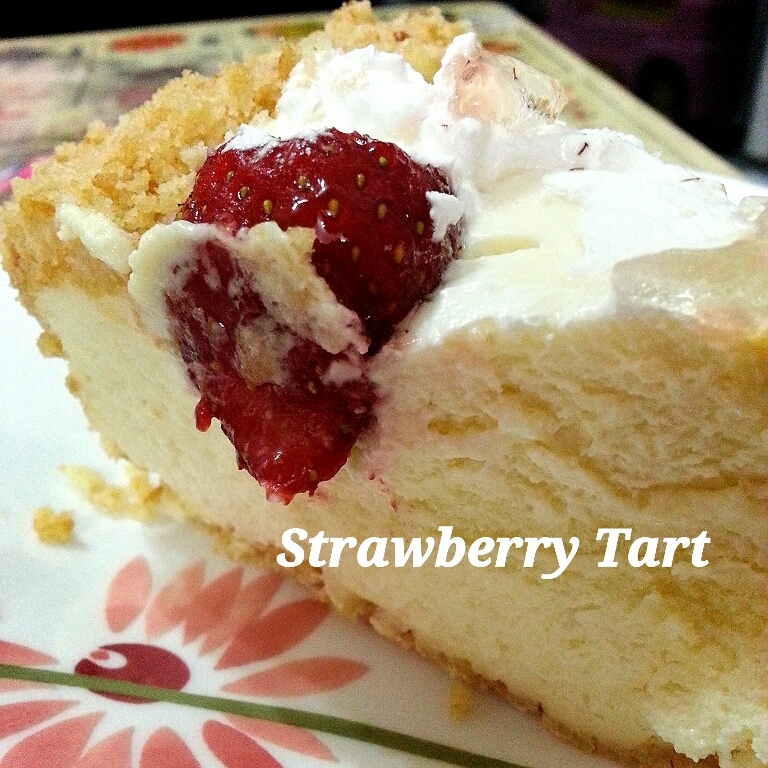 Everyone of us loves it….Yay…..at least I found a good baker in Seremban!! 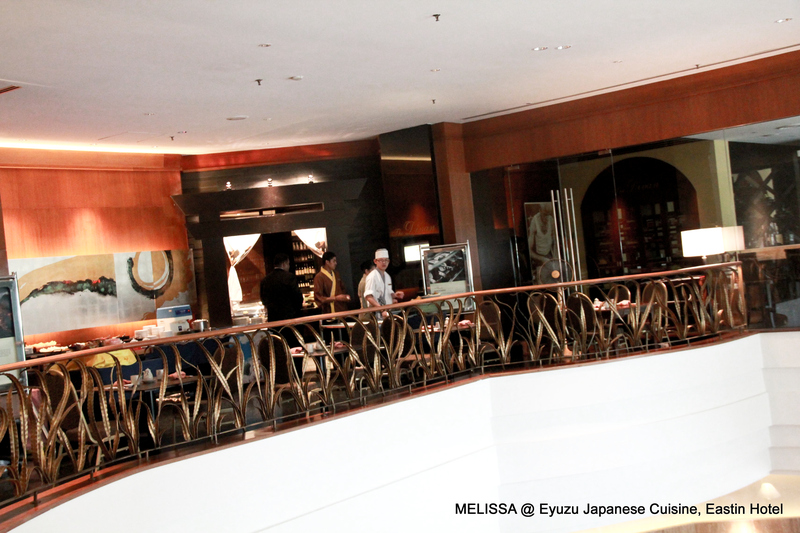 I visited Eyuzu Japanese Cuisine, Eastin Hotel two weeks ago. 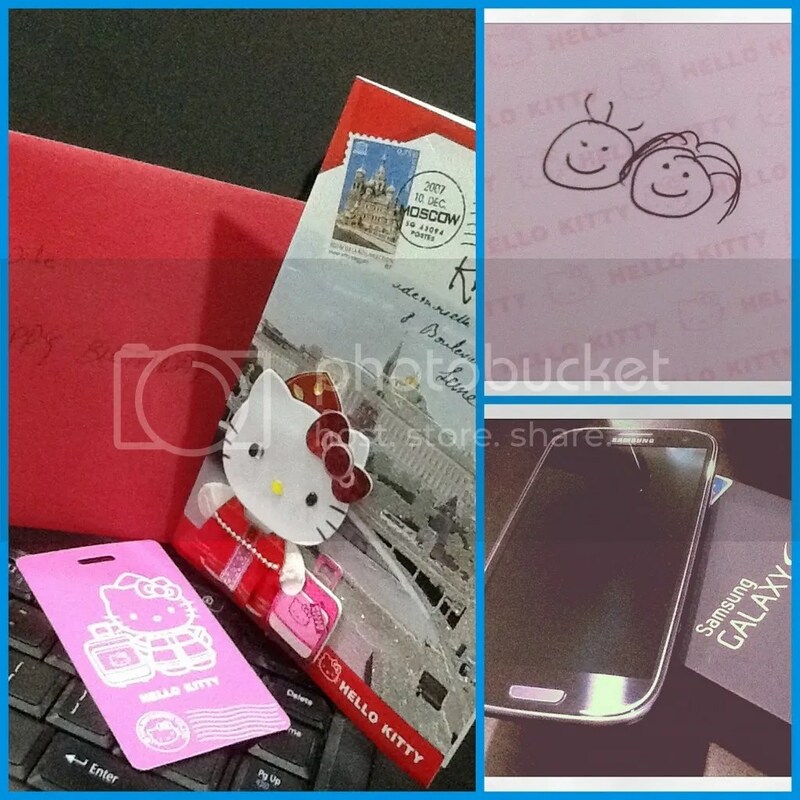 Last 2 months, I managed to grab this good deal from Everyday. 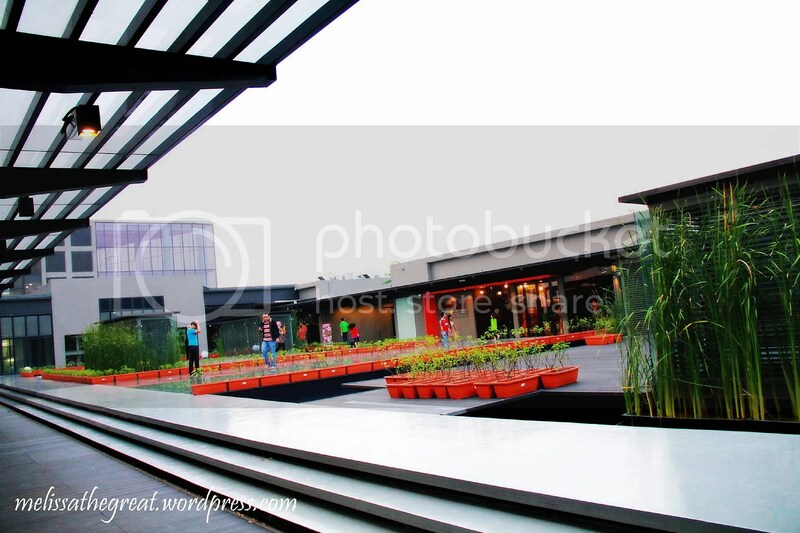 It attracts 5000 buyers with the value price of RM46/ person. 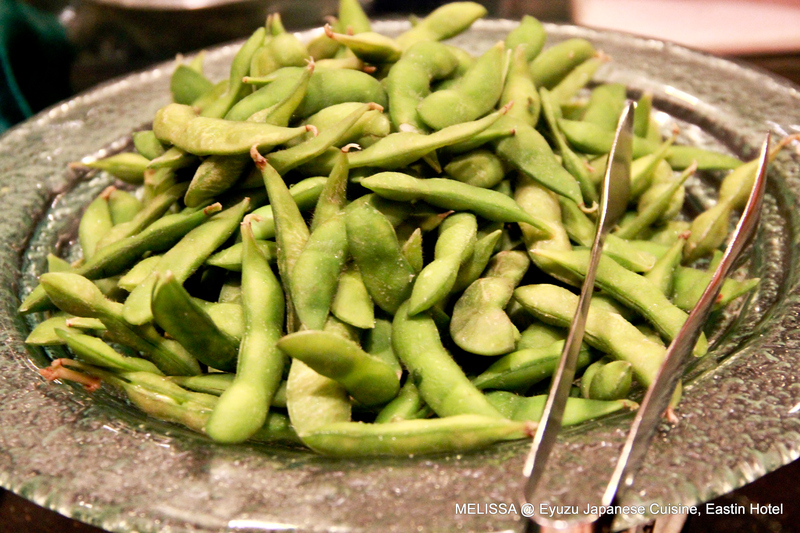 Applicable for dinner from Friday – Sunday. Thought it would be a great opportunity to use it during ma birthday. 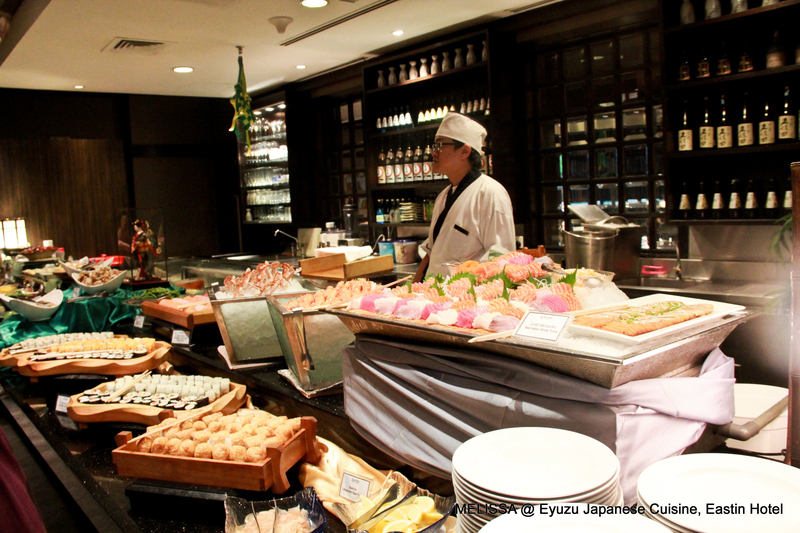 Though the dinner begins at 6.30pm, I was rather surprised seeing a large number of diners queuing at the entrance of Eyuzu (located at first floor). What’s more surprising was that everyone was holding a printed copy of their coupon! 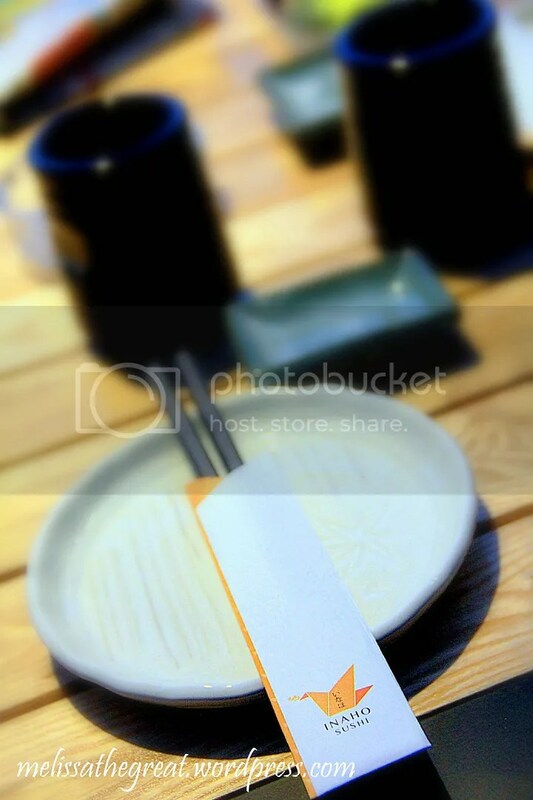 Wonder do Eyuzu still serve quality food though knowing the fact that everyone came with coupons. 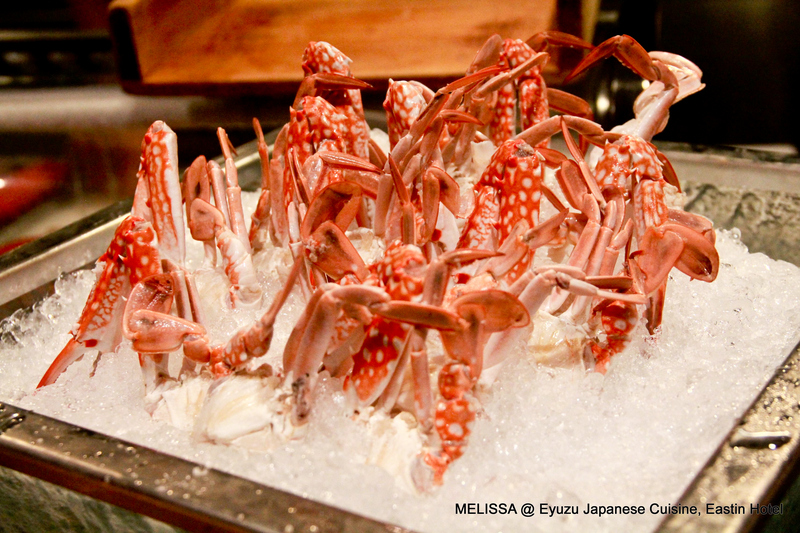 Taking after the name of Japan’s rare and expensive fruit of mysterious provenance – /yuzu – /Eyuzu at the Eastin Hotel represents authenticity and exquisiteness. 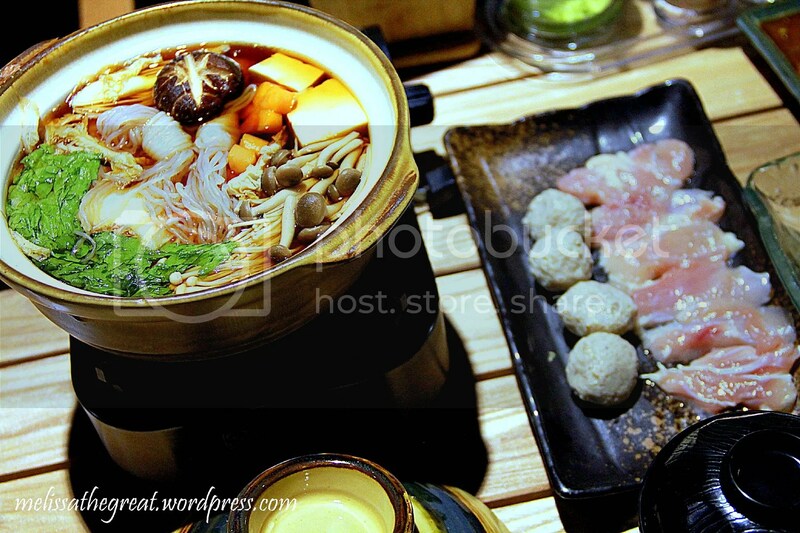 Recently awarded “*Best Asian Cuisines Restaurant*” and “*Best Asian Cuisine Chef*” by the Hospitality Asia Platinum Awards 2005/2006, you will find haute cuisine such as sizzling teppanyaki, sukiyaki, crispy tender tempura and sumptuous sashimi. 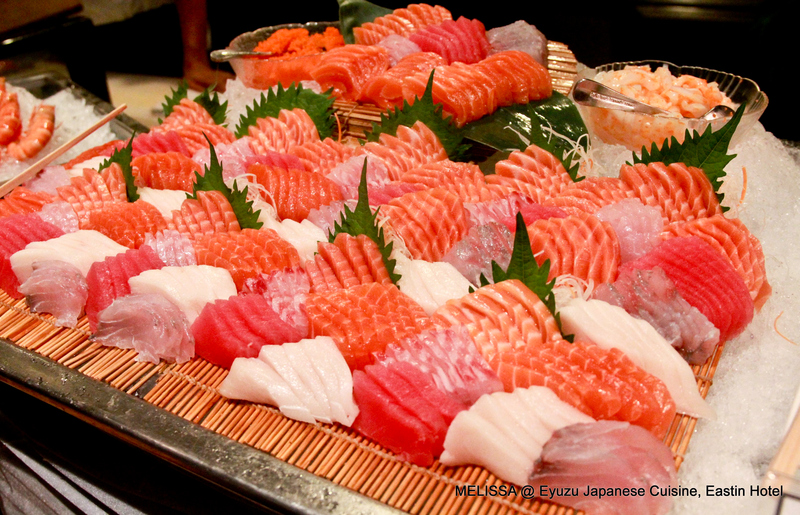 WOW…check out the fresh sashimi!! Each slice are equally thick. 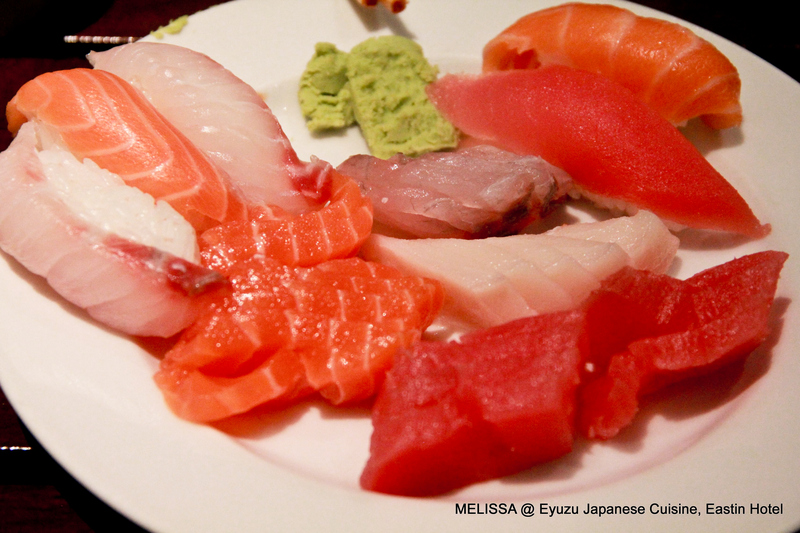 I was told that they served Grade A sashimi. 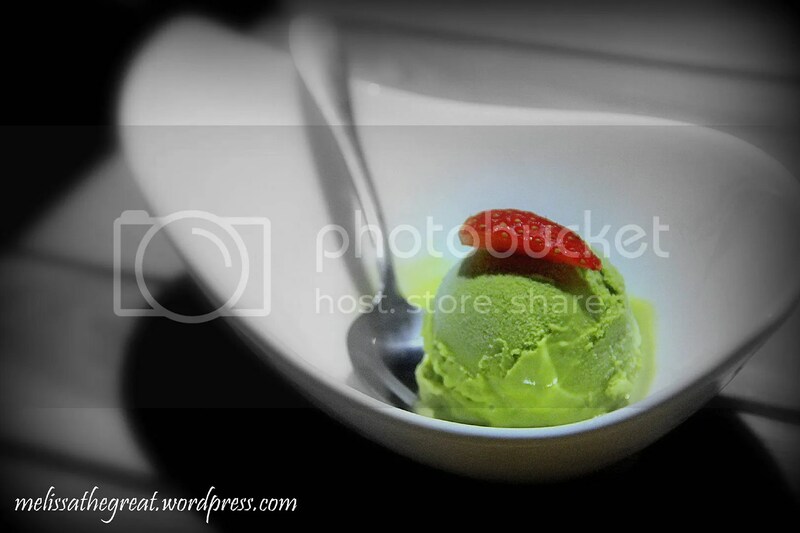 SLURRRPPP….wanting more! Enjoyed each and every piece of it. All were place in a small bowl. Look so pleasant and handy! Unagi was good. Unfortunately the chicken cutlet were quite lousy. Very bland…. 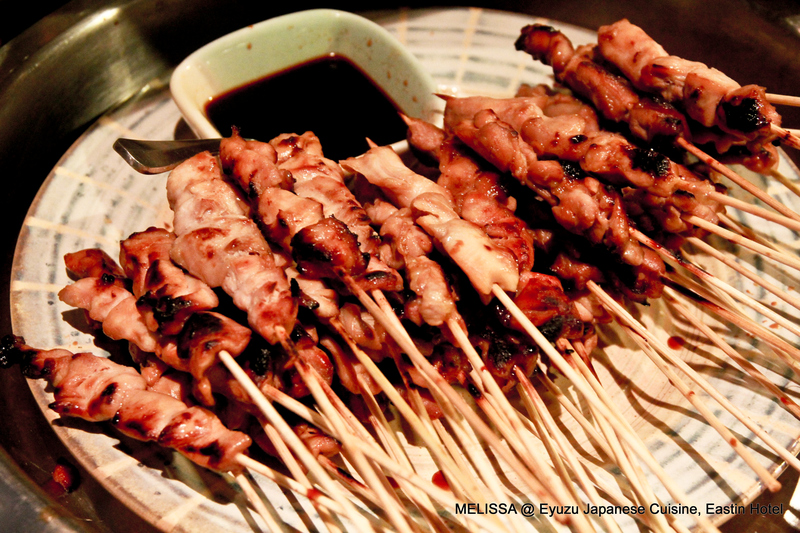 Chicken Skewer – not nice. meat too dry. 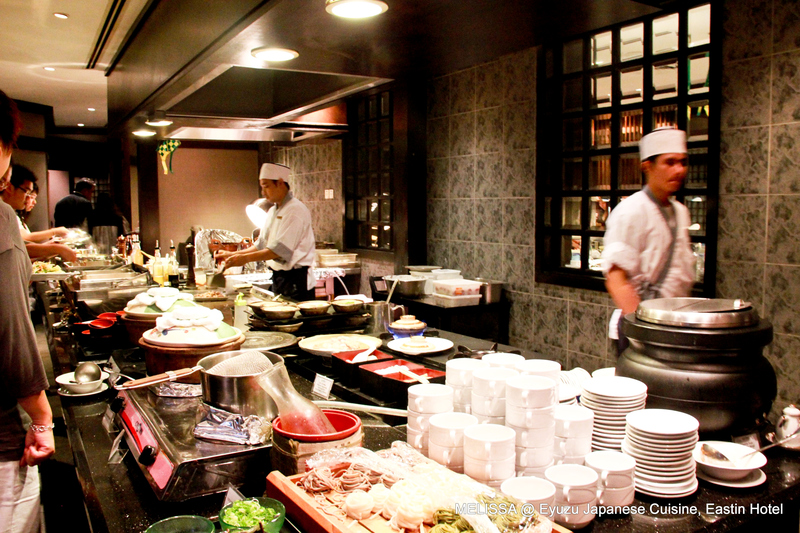 Teppanyaki Section. 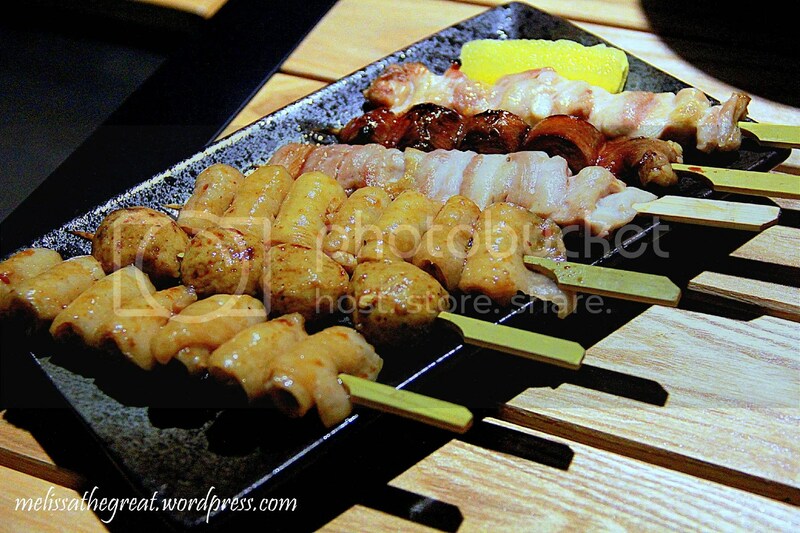 Pick your choice of meat and get them to cook for you. 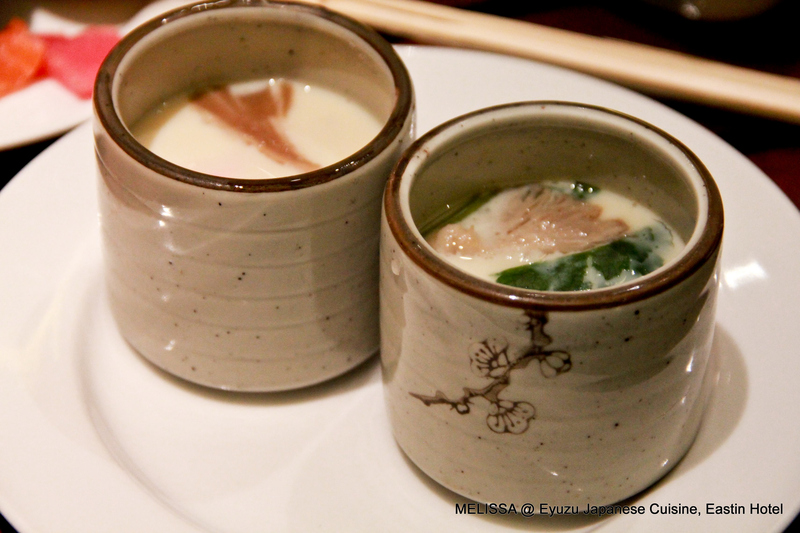 Chawan Mushi was awesome. 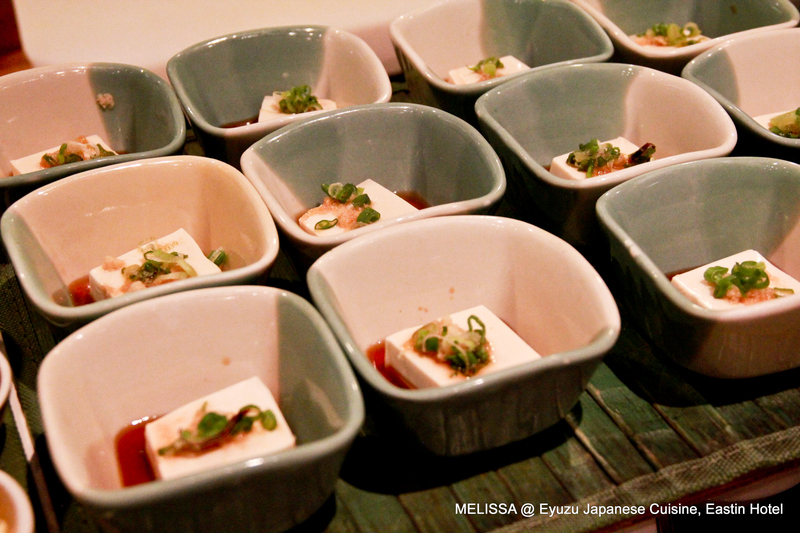 Silky smooth egg with condiments beneath. 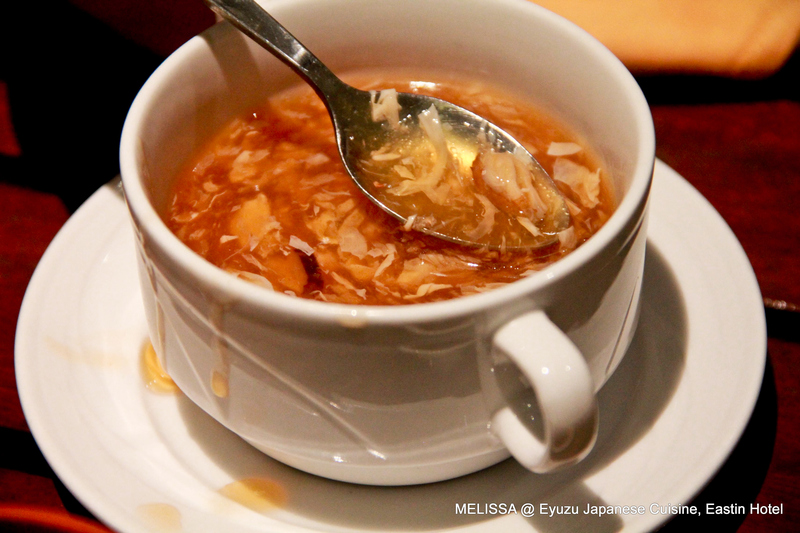 Shark Fin Soup – couldn’t find any shark fin though. 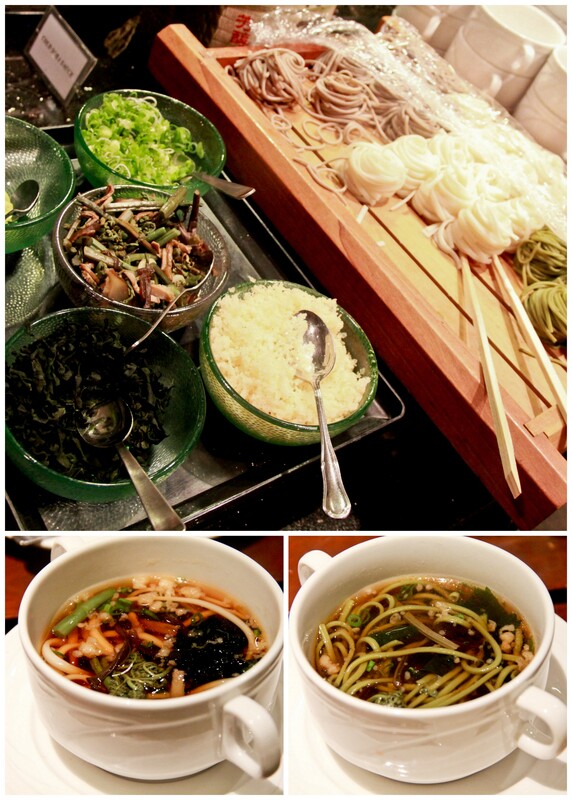 Customize your own udon or soba with some condiments. Delicious! 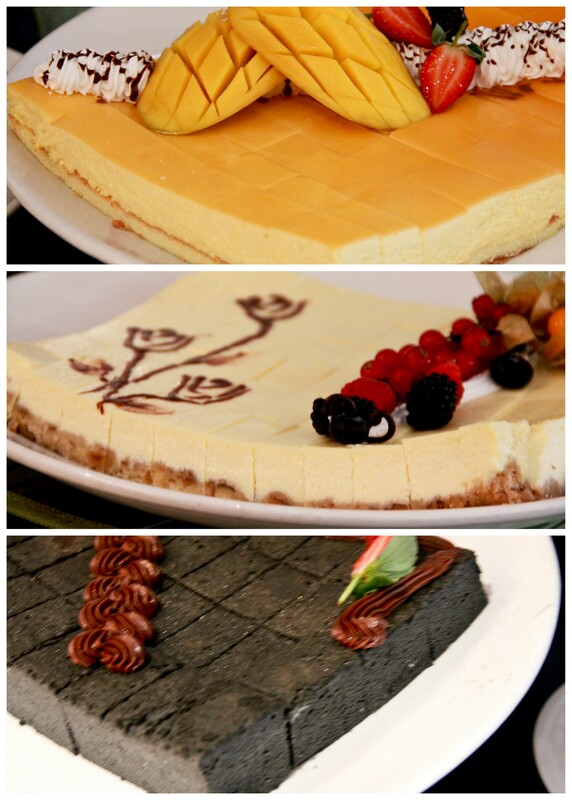 Types of cakes. But they were just average. 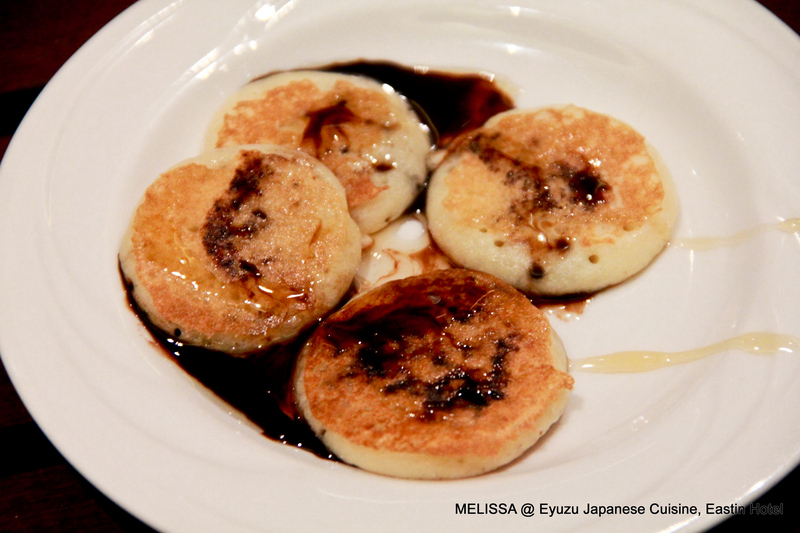 Japanese Pancakes were made fresh on the spot. I added honey and chocolate sauce on it. They were small, not too thick and very fluffy. NICE! 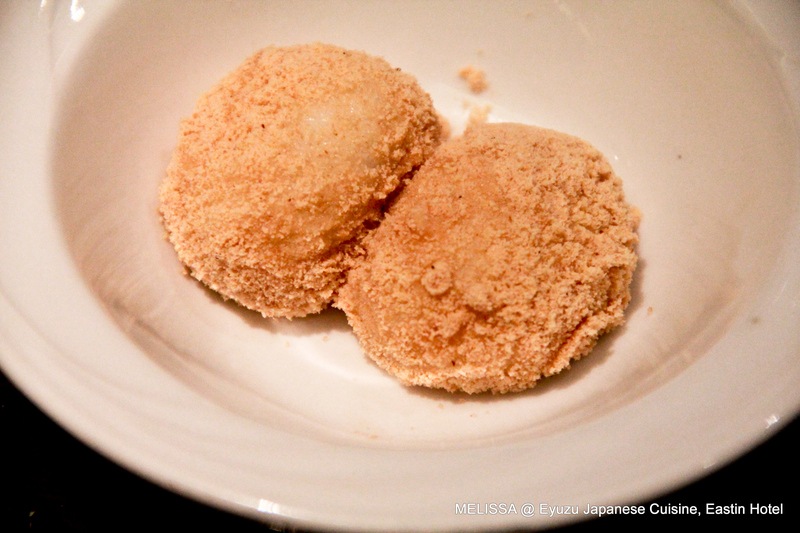 Mochi with fillings. (peanut, black sesame, red bean). They are my favorite. 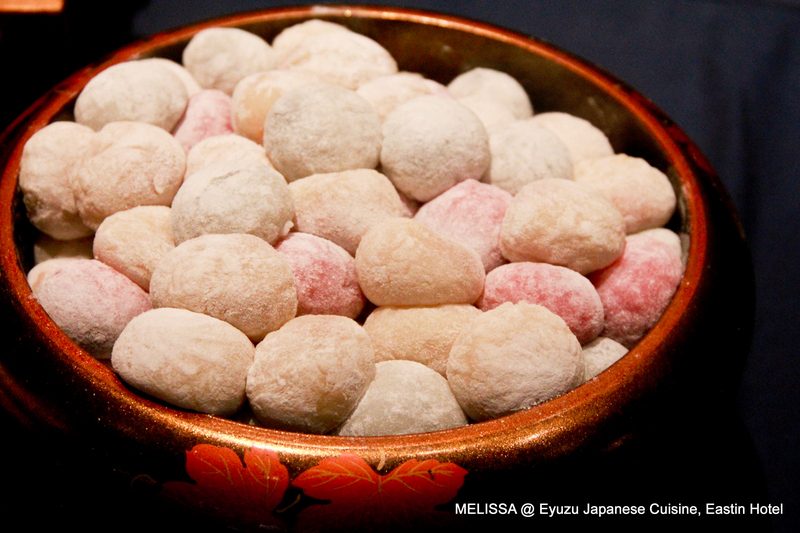 How about some Hot Mochi? 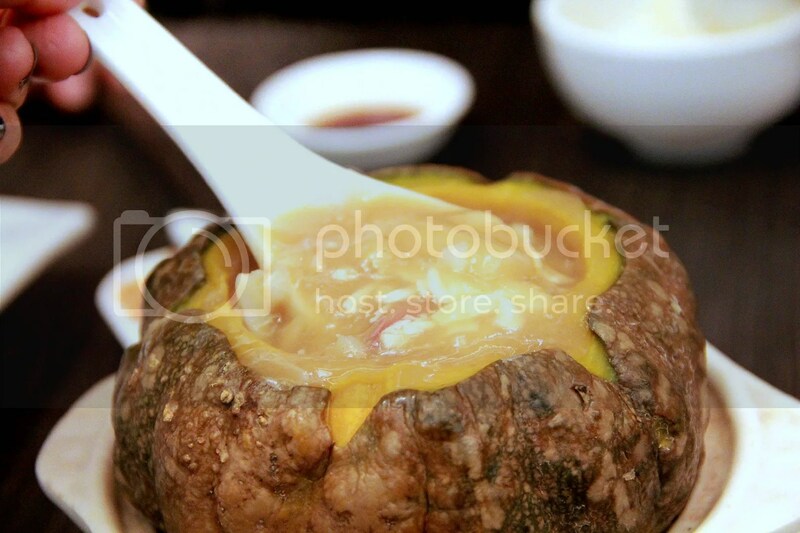 They are glutinous ball with fillings boiled in warm water then coated with peanuts. So, its served warm. Unfortunately I think its overcooked. So, it was kinda mushy. 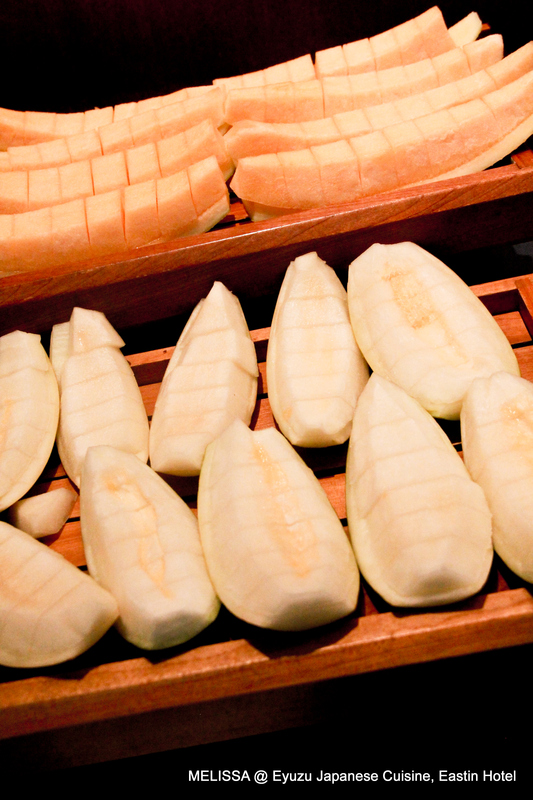 The very laku slices of Melon. The natural sweetness and fragrant which tells me to return for more. 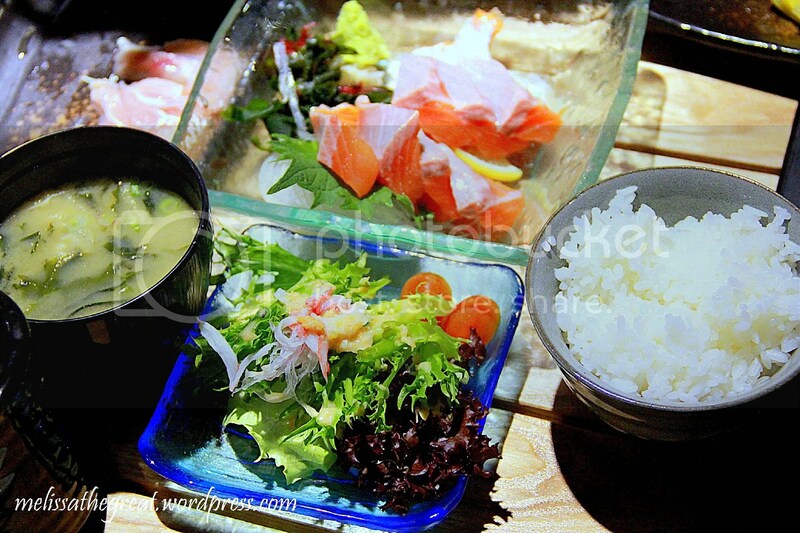 Though there were some not so nice dishes, but with that superb Sashimi I had…I will be happy enough!